Korea’s Jiyai Shin shot a superb final round 4 under par 69 to win the 2016 RACV Ladies Masters at RACV Royal Pines Resort today, defeating England’s Holly Clyburn by three shots. Shin had held the overnight lead by two shots from Clyburn and Sweden’s Camilla Lennarth, and the talented European pair piled on the early pressure. The 28year old Swede made early birdies at the 1st and 3rd holes to join Shin in the lead at 10 under par while Clyburn herself made birdies at 3rd and 6th holes to make it a three way tie at the top, before Shin broke out of the tie with a birdie herself at the 6th to edge clear again. Two more birdies at the 8th and 10th holes saw the affable Korean take a 2 shot lead, however just when Shin seemed completely in charge she would falter with bogeys at the 11th and 13th, where she drove into the water to fall back into a tie for the lead with Lennarth, who had earlier birdied the 8th hole to get to 11 under par. Shin would bounce back with a birdie at 15 and the 16 came the killer blow when she holed from 3 metres and a comfortable three shot lead with just two holes to play after Lennarth had bogeyed the 14th hole. The margin would prove too great for the chasing pack to overcome, and Shin would cruise to a three shot victory with a birdie at the last for a 4 under par round of 69. Holly Clyburn birdied the last to finish alone in second place at 11 under par, while Camilla Lennarth and Nicole Broch Larsen finished in a tie for 3rd place at 10 under par. 16 year old Korean Hye Jin Choi finished as the leading amateur at 8 under par in a tie for 5th place, while 2009 RACV Ladies Masters Champion Katherine Kirk finished as the leading Australian at 1 under par in 17th place. Bob Tuohy, chairman of the RACV Ladies Masters, announced today that the sixth RACV Junior Masters tournament would be played at RACV Royal Pines Resort on Monday, February 22 – three days prior to the RACV Ladies Masters. Since the inaugural Junior Masters in 2011, the curtain-raiser to the “main event” has grown in stature and now attracts more than 50 players from Australia and overseas. This year players from Taiwan, Korea, Singapore, Malaysia and New Zealand will join a strong contingent of Australian players. The tournament winner will receive an invitation to play in the 2016 RACV Ladies Masters. Golf fans who appreciate following the next wave of young stars will be certain to have their appetites whet ahead of the RACV Ladies Masters. Last year, Coolangatta and Tweed Heads Golf Club’s rising junior star Rebecca Kay qualified to play in the RACV Ladies Masters and performed extremely well. The 17-year-old finished in a tie for sixth place – just five shots behind champion Su Oh. “Rebecca (Kay) was the leading amateur and even had her own cheer squad from her home club,” said Fay Campbell, who helps run the tournament with Denise Engwirda. A clear indication of the tournament’s growth and success is the fact that this year more than 35 players are on single figure handicaps. “I’m a big fan of promoting and introducing new young talent, which I have done ever since the inaugural Ladies Masters in 1990 and it’s why we introduced the Junior Masters to engage with the wider golfing community and promote the game at grass roots level,” Mr Tuohy said. The Ladies Masters is proudly supported by the Queensland Government though Tourism and Events Queensland, recognising the important role events play in driving visitation and generating jobs. The tournament is where Karrie Webb, Lydia Ko, Minjee Lee, Yani Tseng, Lorena Ochoa and others received their start. Now, through his company and with the support of RACV Royal Pines Resort, junior girls have the chance to test their skills against their peers in a competitive 18-hole shootout. For the winner, it’s an opportunity to play alongside professionals where they can observe and learn how some of the best players in the world go about their work. For the past six years, the RACV Junior Masters has been well supported by the local community, who have the knack of spotting talent from afar. This year should be no different. RACV Ladies Masters tournament chairman Bob Tuohy said the 18-year-old Canadian, ranked 17th in the world golf rankings, would light up the tournament. Over the past 27 years, Tuohy Associates has made a habit of introducing bright, new talent to the tournament. “The Ladies Masters has long been a stepping-stone for golf’s future stars,” Tuohy said. “We have a reputation for unearthing new faces that have plenty of golfing ability. Henderson said she was thrilled to be playing in the event. Last year, Henderson burst onto the scene when she won the LPGA Tour’s Cambia Portland Classic by eight shots and finished in the top-five at the Women’s US Open and Women’s PGA Championship. She was an amateur at the time and her victory was the first by a Canadian since Lorie Kane in 2001. A happy go-lucky person, Henderson is a creative player who has the ability to adapt her game to any golf course – especially long and challenging golf courses. That’s because she hits the ball long and can comfortably draw and fade the ball when required. Henderson, who made the Canadian national golf team at age 14, had a stellar amateur career winning the Women’s Canadian Amateur in 2013 and was runner-up at the 2014 Women’s US Amateur Championship. As an amateur, she won three tournaments on the Canadian Women’s Tour and tied for 10th in the 2014 Women’s US Open at the age of 16. Henderson was the top-ranked woman amateur in the world before turning professional at the end of 2014. Canada’s female athlete of the year in 2015, Henderson carries a 47-inch driver, which helps her generate plenty of power. She is in the top-25 in driving accuracy (79.91 per cent) and greens hit in regulation (78.13 per cent) and ranked in the top-50 in putting average. Two-time Women’s British Open champion and former world number one Jiyai Shin will make her fourth appearance at the RACV Ladies Masters at the RACV Royal Pines Resort from February 25-28. The 27-year-old South Korean thrill-seeker will add star-power to the field that includes seven Solheim Cup players as well as former champions Cheyenne Woods, Su Oh and Laura Davies. Shin has 45 professional victories worldwide including 11 on the LPGA Tour, 21 on the LPGA of Korea Tour, 11 on the LPGA of Japan Tour and one on the Asian Golf Tour. 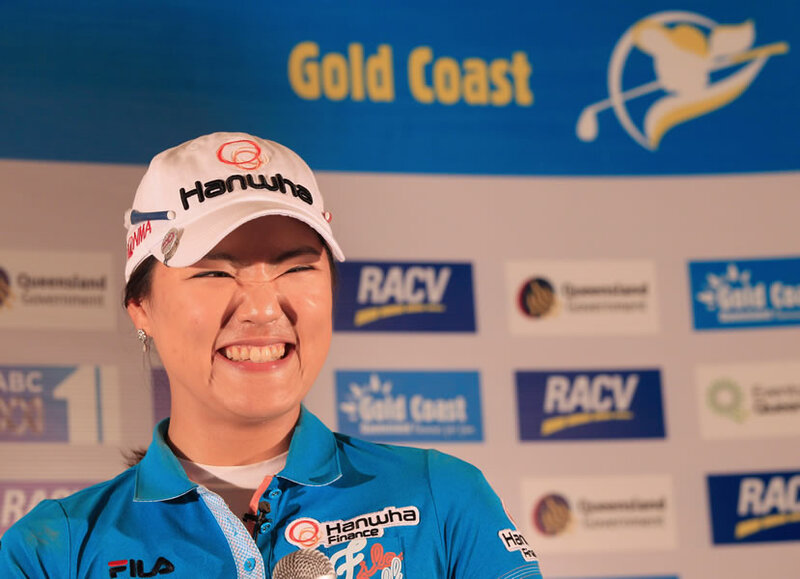 “I am so happy to be playing in the RACV Ladies Masters on the Gold Coast,” Shin said. “Every time I visit the Gold Coast I really enjoy myself. “The Gold Coast has beautiful beaches and great food, but the best part is playing in the fantastic golf tournament. “I have great memories of playing in the event in previous years – meeting the fans, seeing all the other players and doing my best. “Last time I played in the tournament I marked the occasion by taking my first skydive. RACV Ladies Masters tournament chairman Bob Tuohy said Shin’s inclusion in the field was a tournament coup. “Jiyai Shin is a world-class player,” Tuohy said. “Her credentials are fantastic and she is one of the world’s best ever players. Minister for Tourism and Major Events Kate Jones said the addition of one the best players in women’s golf was a great boost to the tournament supported by Tourism and Events Queensland under the It’s Live! in Queensland events calendar. “I’m delighted that Jiyai will return for the 2016 Ladies Masters, Queensland’s world-class women’s golf tournament, for another shot at claiming the title,” Ms Jones said. “Attracting the world’s elite women players inspires thousands of visitors to Queensland and reinforces the Gold Coast’s reputation as a premier destination for major sporting events. In 2008, Shin made the golfing world sit up and take notice when she became the first non-member to win three LPGA Tour events. A year later, she was named LPGA Tour Rookie of the Year and then topped the tour’s money list with more than $US1.8m ($A2.5m). Since then she has taken her career earnings to more than $US6m ($A8.5m). Shin has an infectious smile, a winning personality and is extremely popular with fellow players. On tour, Shin’s known as the “Final Round Queen” – a moniker given to her for coming from behind in the final round. Another sobriquet is “Chalk Line” because of her penchant for hitting tee shots straight down the middle of the fairways. She might be diminutive in stature (157cm or 5’1”), but her driving accuracy and greens in regulation statistics are first class. Her fairways hit statistics stand at 92.86 per cent and greens in regulation at 79.63 per cent. She also has amazing control and accuracy with her fairway metal and hybrid clubs. Shin, who took up golf aged 11, honed her skills by reading Jack Nicklaus instructional books. Because Nicklaus was her idol, Shin even wore caps and apparel emblazoned with the Golden Bear logo even though she was not a paid endorser. In 2005, aged 17 and still an amateur, Shin won her first LPGA of Korea Tour event. She turned professional at the end of 2005 and quickly became a dominant force on that tour winning Rookie of the Year in 2006 courtesy of three victories. She then took out back-to-back Player of the Year honours. In 2007, Shin won 10 LPGA of Korea Tour events from 19 starts. While her career is littered with highlights, she was dealt a cruel blow when aged 16. Her mother was tragically killed in a road accident that left her brother and sister seriously injured. While the painful memory remains, Shin is happiest when she is playing golf and entertaining the galleries. Her experience and quality of play make her one of the leading candidates to lift the RACV Ladies Masters impressive crystal trophy on Sunday, February 28. FOOTNOTE: Jiyai Shin won her first Women’s British Open in 2008 and her second in 2012 when she defeated current world number two Imbee Park by nine shots. Shin also won the Evian Masters in 2010 and lost a playoff to Karrie Webb in the 2008 Women’s Australian Open. Cheyenne Woods returns to Royal Pines Resort on the Gold Coast as a former champion of the RACV Ladies Masters and should she reproduce the form that saw her sweep to victory in 2014, she will have a great chance of lifting the crystal trophy for the second time. The popular American, well-known as Tiger Woods’ niece, is making her third successive appearance in the tournament to be played from February 25-28. Born in 1990, ironically the same year as the inaugural Australian Ladies Masters, Woods has always looked the part on the golf course – stylish and oozing charisma. As a rookie in the field in 2014, Woods soon worked out a strategy that fitted perfectly with her ability to play to her strengths and finished two shots clear of Australian sensation Minjee Lee, an amateur at the time. She made light work of the unfamiliar golf course and became one of only a handful of players to break par in every round when she carded 69-67-71-69 for a 276 total – 16-under par. Woods, who joined the Ladies European Tour in 2013 and currently plays on the US LPGA Tour, was denied last year when she finished in a tie for 26th. From Phoenix in Arizona, Woods is the daughter of Earl Woods Jnr, Tiger’s half brother. She turned professional in 2012 after an All-American career at Wake Forest University. Her only previous professional victory came in 2012 in the SunCoast Series in the US. Tournament Chairman Bob Tuohy announced today the 27th RACV Ladies Masters will be hosted by RACV Royal Pines Resort on the Gold Coast from 25-28 February 2016. The Graham Marsh designed course which was unveiled earlier this month for the Men’s Australian PGA Championship, will provide a totally new playing experience for the field in the Ladies European Tour (LET) and Australian Ladies Professional Golf (ALPG) co-sanctioned RACV Ladies Masters. This event is supported by the Queensland Government through Tourism and Events Queensland and promoted as part of the It’s Live! in Queensland calendar of events. The event will again be broadcast live in Australia by ABC TV Sport and will be broadcast internationally providing valuable destination branding for the Gold Coast and generating millions of dollars in economic benefit to the region. Karen Lunn (CEO) ALPG said “On behalf of the ALPG and our co-sanctioned partners at the Ladies European Tour I would like to pay particular thanks to RACV for their ongoing support as the title sponsor of the RACV Ladies Masters, and also to Tourism and Events Queensland and the City of Gold Coast for their support of the tournament. We are delighted to be once again returning to the Home and Championship Golf in Australia for the 2016 RACV Ladies Masters. I am sure the players will enjoy the newly designed 18 holes at RACV Royal Pines Resort for the first time in 2016. The ALPG look forward to again welcoming players from more than 27 countries to the Gold Coast which is one of the players favourite destinations. We look forward to making the 2016 RACV Ladies Masters the best ever! One hundred and forty four players from more than 27 countries including amateur invitations and Defending Champion, Australia’s Su Oh will contest the 27th RACV Ladies Masters. Further player announcements will follow in early January. 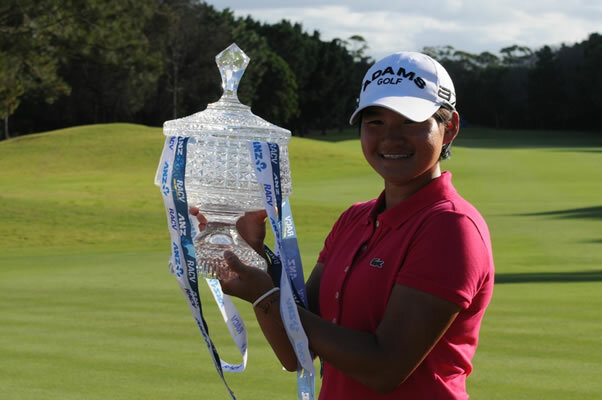 Victorian teenager Su Oh signalled her arrival as a world class player when she captured her first professional victory in only her second professional tournament in the RACV Ladies Masters at Royal Pines on the Gold Coast. With rounds of 69, 75, 72 and 69 Oh finished atop of the leaderboard at seven-under-par and three clear of 2009 champion Katherine Kirk (69) and England’s Florentyna Parker (69) and Charley Hull (73). As Kirk (69) and Englishwomen Florentyna Parker(69) walked to the clubhouse sharing the lead at four under, Oh made her winning move. The teenager reeled off four straight birdies at the 15th, 16th, 17th and 18th to finish in fine style. Outright fifth was Annie Choi, while six players finished at two-under-par including South African Lee-Anne Pace and leading amateur Rebecca Kay. “I spoke to Karrie. I asked her: ‘what do I need to do, you’ve won this eight times’,” she smiled. Oh burst into tears of joy on the 18th green after tapping in her winning birdie putt, hugging her caddie father SG. “I got pretty emotional, didn’t I? That was a bit weird,” said the exuberant teenager. Co-runner up and 2009 winner Katherine Kirk was full of praise for Oh and the way in which she claimed her first victory after having secured an invite from tournament director Bob Tuohy. “She looked pretty composed out there, she’s got the goods,” declared Kirk who fired rounds of (70-75-72-69). Oh who the world’s number one ranked amateur in 2013. She made her professional debut in last week’s Victorian Open finishing second. The Ladies Masters has a tradition of producing world class players since 1990 with Webb, Sweden’s Annika Sorenstam and Mexico’s Lorena Ochoa all going on to be ranked No.1 in the world. Oh will be looking to go back-to-back at next week’s ISPS Handa Women’s Australian Open. England’s Holly Clyburn, Charley Hull and South Korean Annie Choi share the lead after the wind swept day at the RACV Ladies Masters. It was a day where the RACV Royal Pines course won with the best score of the day one-under-par 72, which was had by only a handful of players. The leaderboard is jam packed with 17 players within four shots of the lead. The trio lead at four-under-par, Clyburn posted a one-over-par 74, while Choi and Hull had two-over-par rounds. The leaders will take a slender one shot lead into Sunday over Australian Su Oh (72), Norway’s Tonje Daffinrud (72) and second round leader Rebecca Artis. Artis took at three shot lead into Saturday struggled in the conditions and carded a six-over-par 78, however she is right in the mix. Local 16-year-old amateur Rebecca Kay finished her round in style with an eagle and got the biggest cheer from the crowd on the 18th. Kay (73) shares seventh place with Malaysian Michelle Koh (72) and Chinese Taipei Ssu-Chia Cheng (74) at two-under-par. Three players are at one-under-par and just three back, one of those players is Rolex World No. 29, Lee-Anne Pace. Pace is the top ranked player in the field and finished birdie, eagle and is will looking to capture her 10th LET title. Last October she came from five shots down to win the South African Women’s Open. 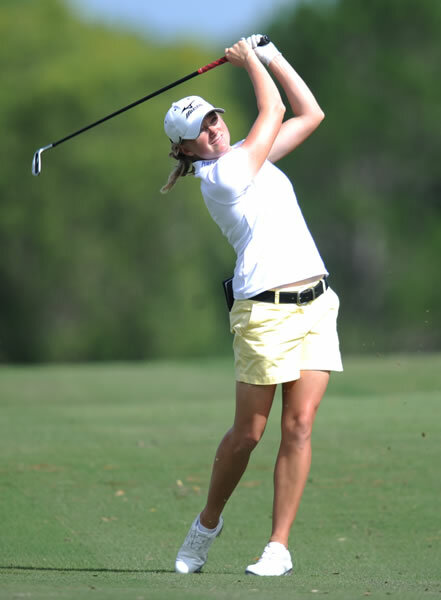 2009 champion, Katherine Kirk is one of five players at even par. England’s Melissa Reid and Gwladys Nocera are also at even-par and are all very experienced players who could also make a charge on Sunday. Defending champion Cheyenne Woods fired an even par round, but that was enough to move up around 30 places. Woods is at five-over-par and tied for 37th. Tickets for the RACV Ladies Masters are on sale at Ticketmaster.com.au with children under 16 free if accompanied by an adult. Members of RACV, RACQ, NRMA, RAASA, RACWA, RACT, RANT and NZAA will receive free entry plus one guest by presenting their membership card at the entrance gate. The field for the 2015 RACV Ladies Masters is just about set and what a high calibre field it is shaping up to be, with no less than six LPGA winners and over 25 Ladies European Tour winners ready to fight it out. The 26th staging of the event will include representation from a record 28 countries. The 144 strong field will be gracing the fairways of the RACV Royal Pines Resort from the 12 to 15 February on the Gold Coast. LPGA winners include Sophie Gustafson, England’s Laura Davies, Queensland’s Katherine Kirk, Canadian Lorie Kane, South African Lee-Anne Pace and Australian great Rachel Hetherington. Hetherington is making a return to the ALPG tour since retiring from the LPGA in late 2010. She has been busy, Hetherington and her husband, Greg Ritchie, added to their family, with the birth of Annie several years ago. Hetherington also has her own Golf Range and also teaches at Sanctuary Cove. The 8-time winner on the LPGA has finished in the top 10 six times in her career with her best finish being runner-up to Karrie Webb in 2001. Hetherington will certainly be a crowd favourite along with defending Champion Cheyenne Woods and three time winner Davies. The field for the 2015 RACV Ladies Masters is taking shape nicely with the confirmation that England’s young gun, Charley Hull will be competing for the title in February. The 2014 Order of Merit winner on the Ladies European Tour will be one of the favourites when she walks the fairways of the RACV Royal Pines Resort from the 12 to 15 February on the Gold Coast. The talented Hull certainly enjoys the location of the tournament, “I love the fact that at the RACV Ladies Masters we can play golf in the morning and go to the Beach in the afternoon. That’s just about my perfect day! I’m really looking forward to being back on the Gold Coast this year. “ Hull stated. The 18- year-old is heading into her third year as a professional has already accomplished a lot in a short pro career. In her rookie year in 2013, she finished runner-up in her first five events, finished sixth on the Order of Merit and subsequently she went on to win the Rookie of Year award on the LET. Hull was also the youngest player ever to play in the Solheim Cup and was part of the winning European Team that won the Cup on American soil and in the process she defeated major champion Paula Creamer in her singles match. Hull won her maiden professional event early in 2014, Lalla Meryem Cup. She had a very consistent season posting another eight top 10 finishes to finish with Euro 263,096. A rule change saw the talented golfer finish on top of the LET Order of Merit (OOM). Hull was the youngest player to win the OOM. The English player visited the Gold Coast for the first time in 2014 and is looking forward to improving her 10th placing in her first outing. Hull will have to get past the likes of local Katherine Kirk, defending champion Cheyenne Woods, three time winner Laura Davies and South African Lee-Anne Pace in the field. 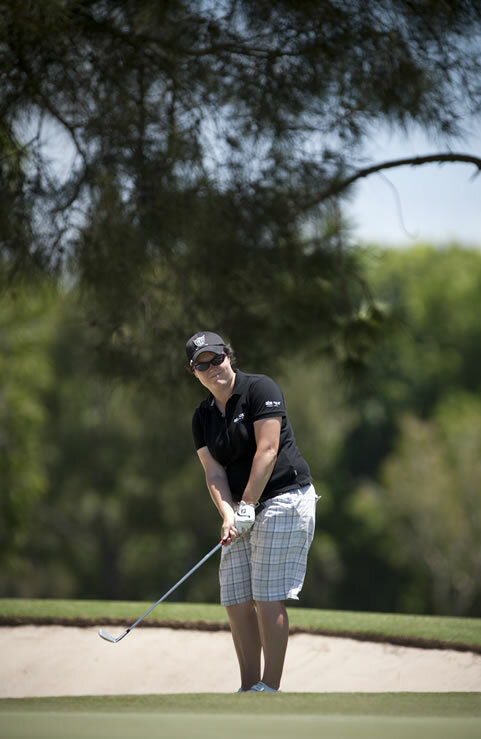 Queensland’s Katherine Kirk will be vying for her second RACV Ladies Masters title in February. The 2009 Ladies Masters Champion has confirmed she will be one of the stars teeing it up at the RACV Royal Pines Resort from the 12 to 15 February on the magnificent Gold Coast. The two times LPGA winner is coming off another solid season on the LPGA where she played 26 events, made the 21 cuts, posted two top 10 finishes, with her best finish T4 in the Marathon Classic. Kirk finished 60th on the Money List with US$266,743. Speaking from the USA, Kirk spoke about how much she enjoys the event and what it would mean to win again. “The Ladies Masters is one of my favourite events because the crowds are always so supportive and it reminds me of my roots and all the people who've helped me in my career. Plus being a past champion means you always have fond memories of the event, the people that make it happen, and the course. Kirk’s commitment to the ALPG Tour is fantastic as she won’t be arriving onto the Gold Coast until the Wednesday and teeing it up Thursday as she is playing in the LPGA in the Bahamas the week before. Kirk joins defending champion Cheyenne Woods and South African Lee-Anne Pace in the field with more high profile players to be confirmed in coming weeks. LPGA winner Lee-Anne Pace will be looking to get her 2015 off to a flying start at the RACV Ladies Masters on the Gold Coast in February. The 33-year-old is a confirmed starter at RACV Royal Pines Resort from the 12 to 15 February, the 26th staging of the event. The Rolex Ranked World No. 31 had a fantastic 2014 capturing her first LPGA victory in October at the Blue Bay LPGA in China and finishing 38th on the LPGA Money List with US$467,559. October turned out to a month to remember for the talented South African as the week before she won her first LPGA title, she won her first national open, the Cell C Women’s South African Open in a playoff. It was the Pace’s ninth Ladies European Tour. Pace, whose best finish at the Ladies Masters was equal fifth back in 2011, will be looking to get 2015 off one the right foot. Tournament Chairman Bob Tuohy said he was thrilled to welcome Lee-Anne back to the RACV Royal Pines Resort as she brings a lot of good golf to the RACV Ladies Masters and no doubt be in the mix on the final day. Pace joins defending champion, American Cheyenne Woods in the field with more high profile players to be confirmed in coming weeks. The effervescent Cheyenne Woods will return to the RACV Royal Pines Resort to defend her RACV Ladies Masters title in February next year. Woods captured her first major professional victory earlier this year at RACV Royal Pines when she held off Australian teenage sensation Minjee Lee. Tournament Chairman Bob Tuohy confirmed that RACV had stepped up its commitment to women’s golf, assuming the solo naming rights sponsorship for the 2015 RACV Ladies Masters to be played from 12 to 15 February. The event will again be co-sanctioned by the Ladies European Tour and Australian Ladies Professional Golf and celebrate its 26th year since inception in 1990. 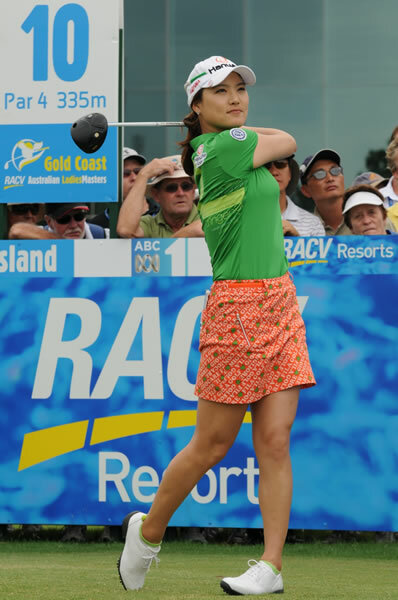 The 2015 RACV Ladies Masters is proudly supported by Tourism and Events Queensland, J Golf Korea, The City of Gold Coast and Thrifty and will be broadcast nationally by ABC Sport on Saturday 14th February and Sunday 15th February, live to Sky New Zealand and J Golf Korea with a total global household reach of in excess of 145,000,000. Mr Tuohy paid tribute to all event stakeholders and co-sanction partners and in particular, the ongoing commitment RACV has made to the event and golf in general. “In addition to the developments on course, players, their families and spectators will enjoy a vastly changed RACV Royal Pines Resort with the completion of a major expansion and development of facilities. These include the stunning award-winning One Spa, a state-of-the-art fitness centre and extensive conference and events facilities,” Mr Jordon said. Gold Coast Mayor Tom Tate said the city was honoured to host an event with such a long and prestigious history. “The line-up for the 2015 Ladies Masters shows a seriously competitive field and I really look forward to welcoming the players and seeing some quality golf played next February,” he said. Karen Lunn, Executive Director of the ALPG said “It is great news to have the defending champion committed to the RACV Ladies Masters for 2015, Cheyenne has been a great ambassador for the tournament. On behalf of the co-sanction partners ALPG and LET, I would like to take this opportunity to say a huge thank you to RACV for their continued commitment to the Ladies Masters and for taking on the title sponsorship of the event in 2015. RACV Royal Pines Resort has over the years established itself as a world class facility and tournament venue, and the recent upgrades to both the resort and the golf course will only add to the prestige of the event moving forward. American Cheyenne Woods secured her first major professional tournament when she held off a strong challenge from Australian amateur Minjee Lee to win the Volvik RACV Ladies Masters on the Gold Coast. The 23-year-old shot a final round of four-under-par 69 on the RACV Royal Pines layout to finish the tournament at 16-under-par, two shots ahead of 17-year-old Lee who also posted a 69 to finish on 14-under-par. South African Stacy Lee Bregman (72) and Swede Camilla Lennarth (70) finished in a tie for third position at 12-under-par. Another Swede Caroline Hedwall (66) soared up the leaderboard to finish in a share of fifth position with South Korean amateur So Young Lee and fellow compatriot Minsun Kim. It's the best result in Woods' two-year professional career, with the interest in the niece of superstar Tiger Woods resulting in the American Golf Channel taking the final two hours of the broadcast live into the United States. Encouraging words from her coach before she left for Australia have certainly came true. Woods started the final round with a one shot lead, she immediately picked up a shot with a birdie on the par-4 1st. A bogey on the par-4 4th and a hat-trick of birdies on the par-4 6th, 7th and 8th by the reigning Australian amateur champion brought the pair together. However, Woods took the outright lead again with a birdie on the par 5 9th. The world No.363 didn't relinquish that advantage, adding birdies on the par-5 12th and 15th before a triumphant birdie on the par-5 18th completed a five-birdie, one-bogey final round. Matching pairs of 69 and 67 sees American Cheyenne Woods and South African Stacy Lee Bregman on top at the Volvik RACV Ladies Masters. However, the biggest news came towards the end of the day, when defending champion, Karrie Webb was disqualified from the tournament for signing an incorrect scorecard. Webb inadvertently had forgotten about the change in par from 72 to 73 and thought she had signed for a two-over-par, when the scorer check person said 74 to her, she said that’s correct. On a day of low scoring, both players were out early on a sunny morning at the RACV Royal Pines layout and soared up the leaderboard. Woods round included five birdies, one bogey and an eagle on the 1st, her 10th hole, when she holed her 7 iron from 150 yards. While for Bregman, she had an extremely good round considering she snapped her 8-iron on her opening hole after hitting a tee and had to play the remainder of her round without it. The pair hold a one shot lead over England’s Trish Johnson who had a hot putter today to fire a seven-under-par 66. Swede Camilla Lennarth (67) is outright fourth at eight-under-par. England’s Charley Hull also went low, her seven-under-par 66 to share fifth place with first round leader American Katie Burnett. For Woods, everything was going well. Bregman is attributing her form to coming out to Australia early and playing in the Club Car Series and other ALPG major tournaments. First round co-leader American Jessica Korda is tied for 11th after an even par round today. The cut was made at three-over and 70 players will tee it up on the week-end. American Jessica Korda loves coming to Australia and it certainly showed when she carded a five-under-par 68 to be co-leader after the opening round of the Volvik RACV Ladies Masters being played on the beautiful Gold Coast. Korda shares the lead with fellow compatriot Katie Burnett who was out late in the day and birdied her last two holes, the 8th and 9th to join Korda at the top of the leaderboard. It is a truly international leaderboard, the Americans are on top and they hold a slender one shot lead over the chasing pack, which is led by South Africans Lee-Anne Pace and Stacy Lee Bregman , Canadian Lorie Kane, France’s Valentine Derrey and fellow American Cheyenne Woods. Australians Kristie Smith, Sarah Kemp, Rebecca Artis and amateur Minjee Lee, the Netherlands Dewi-Claire Schreefel , Denmark’s’ Line Vedel and China’s Yu Yang Zhang share eighth position at three-under-par. On a windy and cloudy morning, the 20-year-old, Korda, started her round on the 10th tee got off to a perfect start with a birdie. Birdies on the 15th, 17th and 18th holes saw her go out in four-under-par 32. Another four birdies on her front nine were mixed with three bogeys to come back in 36. For Kemp her 20m putt for birdie on the 13th hole, her fourth, kick started a rush of three birdies in her round. "The ball just hung on the edge of the hole for a few seconds before dropping in. That's never happened to me before but it got the round going for me," Kemp said. "It's nice to be up the leaderboard and I want to compete there with Karrie and the other Aussie girls." For defending champion, Karrie Webb it wasn’t the start she was after, she posted a one-over-par 74 to be tied 59th. A highlight of the day was England’s Eleanor Givens who had a hole in one on the par 3 5th. She holed out with a 6-iron. 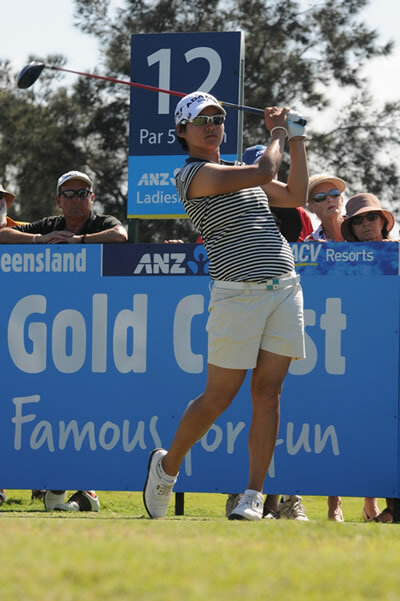 In a major coup, former Rolex World No.1 Yani Tseng, is returning to Gold Coast for the 2014 Volvik RACV Ladies Masters. Tseng, who first started playing in the event as a 16-year-old amateur, has a superb record at Royal Pines. In seven appearances she has won once (2011) and posted another three top 5 finishes. Tseng has been a superstar of women’s professional golf since 2010. In 2011, the Taiwanese player was dominating the women’s game, she started the year off perfectly with back-to-back wins in the ISPS Handa Women’s Australian Open and Volvik RACV Ladies Masters. Following the two wins in Australia, she fulfil one of her dreams, to become No.1 in the World. She was unstoppable for the majority of the year, capturing 11 titles worldwide in total. By the middle of the year, she became the youngest player, male or female, to win five majors. During the 2012 and 2013 seasons Tseng suffered a series of nagging injuries which yielded only ten top ten finishes. 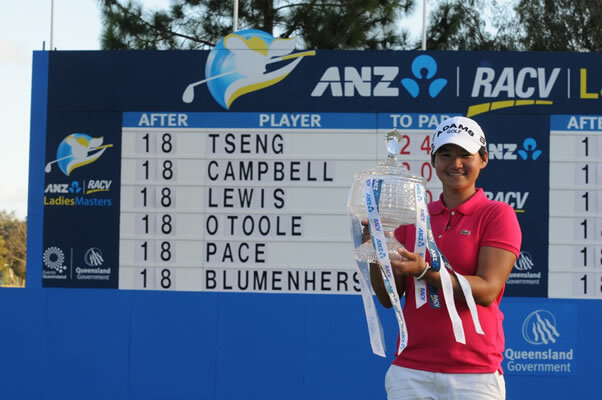 With USD $9,376,000 in official Korean prizemoney to her credit Tseng has now regained her fitness and ready for a big season in 2014 commencing at one of her favorite tour stops at the RACV Royal Pines Resort, February 6-9. Tseng joins defending champion Karrie Webb, Americans Jessica Korda and Cheyenne Woods, Swede Caroline Hedwall and England’s Charley Hull as players confirmed. The event will once again be played under the co-sanction status with the Ladies European Tour and the Australian Ladies Professional Golf. The Volvik RACV Ladies Masters will be broadcast from the Gold Coast by ABC Sport, live throughout Australia, on Saturday 8 February between 2:00pm to 6:00pm and Sunday 9 February between 2:00pm to 6:00pm. TA Golf is pleased to announce two of Team Europe’s best players from their Solheim Cup win are heading to the Gold Coast in February for the 25th staging of the Volvik RACV Ladies Masters. Swede Caroline Hedwall and England’s Charley Hull will be taking on the likes of our own Karrie Webb, Katherine Hull-Kirk, Rebecca Artis, Stacey Keating, Kristie Smith and Lindsey Wright from the 6 to 9 February at the RACV Royal Pines Resort. Hedwall was the stand out player during the Solheim Cup, she won all five matches she was involved in and was the first player in the history of the Cup to do so. The 24 year-old is currently ranked 23rd on the Rolex Women’s World Golf Rankings and is coming off her best season as a professional. It started perfectly with a win in Sydney at the Bing Lee Fujitsu Women’s NSW Open, she then went on to make 21 from 23 cuts on the LPGA and posted six top 10 finishes. Hedwall’s best result was third on three occasions, including at the Kraft Nabisco Championship. She finished the year 14th on the Money List with US$763,104. Hedwall has loves coming to Gold Coast and lists Australia as her favourite country to visit. Hull, is another teenage sensation in women’s professional golf at the moment. The 17-year-old from England had an incredible rookie year in Europe. She started her career with four consecutive runner-up finishes and went on to record another five top 10 finishes in her 14 events in 2013 on the LET. The talented player understandably took home the Rookie of the Year award on the LET, after finishing sixth on the Order of Merit with Euro 135,994. Americans Jessica Korda and Cheyenne Woods will tee it up in the 2014 Volvik RACV Ladies Masters being played from 6 to 9 February at the RACV Royal Pines Resort. The youthful pair is a great edition to the high caliber field being assembled for the 25th staging of the event. Korda, is coming off a fantastic year on the LPGA. In just her third year as a professional, the talented golfer made the cut in all the 21 events she played in and posted six top 10 finishes, with her best finish being runner-up in the Mobile Bay LPGA Classic. She finished 25th on the Money List with US$593,389. Korda will be making her third appearance on the Gold Coast and she is thrilled to be coming back. "I'm excited to return to Australia for the Volvik RACV Ladies Masters in February. The Gold Coast is a fantastic place and I always look forward to going back." Korda said from her home in the States. "My family has some great history in Australia and it's always a thrill for me to play golf there where the fans have been so supportive of my career." Korda, who is currently ranked 39 on the Rolex Women's World Golf Rankings will be one of the players defending champion Karrie Webb will be watching. Webb, who is going for unprecedented ninth Ladies Masters title, will have to watch out for the long hitting American. Korda finished fifth in the 2013 tournament at Royal Pines, so she likes the layout. Fellow compatriot Woods, who is the niece of Tiger Woods, will be back and will be looking to improve on her 33rd finish earlier this year. In 2013 Woods played 11 events on the Ladies European Tour and posted three top 20 finishes in her rookie year. The 23-year-old has full exemption on the LET in 2014. Tournament Chairman Bob Tuohy said "Jessica's and Cheyenne's return to the RACV Royal Pines Resort is welcome and has boosted the high quality of field being assembled". Tournament Chairman Bob Tuohy announced today the Sisters of Swing will return to the Gold Coast for the 25th Annual Volvik RACV Ladies Masters hosted by the RACV Royal Pines Resort between February 6-9, 2014. The Volvik RACV Ladies Masters will revert to a seventy-two hole tournament with increased money. Mr Tuohy acknowledged the on going sponsorship support of Korean Golf Ball Manufacturer Volvik together with long standing event partners RACV, Tourism and Events Queensland, the Gold Coast City Council and Gold Coast Tourism. Defending Champion Karrie Webb is likely to go head to head against New Zealand’s teenage sensation, world number 5, Lydia Ko and a world class field of players from over twenty countries. The 2014 Volvik RACV Ladies Masters will feature many new and exciting new faces as a result of Europe’s crushing victory against arch rivals the US LPGA Tour in the 2013 Solheim Cup. Our television partners, ABC Sport, J Golf Korea, Sky NZ and other international networks around the world will broadcast the Ladies Masters reaching 120,000,000 house holds providing priceless global and domestic exposure for the Gold Coast and our sponsors, Tuohy said. Karen Lunn, Executive Director of the ALPG said on behalf of the Co-Sanction Partners, the Ladies European Tour and Australian Ladies Professional Golf: It is only fitting that the Australian Ladies Masters returns to RACV Royal Pines Resort on the Gold Coast for its 25th Anniversary celebrations in February 2014. The event has been the highlight of the ALPG Tour calendar since its inception in 1990 and it has grown into one of the most significant women's sporting events in Australia. On behalf of the ALPG and our co-sanction partner the Ladies European Tour, we would sincerely like to thank our co-title sponsors Volvik and RACV together with Tourism and Events Queensland and also our other event partners for ensuring the future of this important event on our schedule. Mr Kyung Ahn Moon, Chairman of Volvik said it’s his pleasure to continue to co-sponsor with RACV the Volvik RACV Ladies Masters and return to the beautiful RACV Royal Pines Resort next February and join in the tournaments 25th year celebrations. I personally hope that Volvik will be a memorable brand not only for Australian golfers but also in every other country the international television reaches. Mr Colin Jordan, RACV Managing Director & CEO, said that RACV was delighted to co-sponsor this prestigious women’s event, now in its 25th year at RACV Royal Pines. “As the 'home of championship golf' in Queensland, RACV Royal Pines is looking forward to hosting the event and welcoming the world’s leading players, their families and large crowds,” he said. "We are very pleased to see the tournament revert to a 72-hole format this year. "RACV recently appointed Graham Marsh Golf Design to undertake a redesign of the championship course to increase the challenge of the course for professional golfers, whilst retaining the appeal of the course for amateur, social and corporate golfers. "RACV is very excited with Graham's concept design, which has involved input from both the ALPG and PGA. Works will commence immediately after the Volvik RACV Ladies Masters and are expected to take a couple of years to complete." RACV continues to invest in new and upgraded facilities at Royal Pines for the benefit of Auto club members and guests. A brand new Day Spa will be unveiled before the tournament, work on a new state of the art gymnasium is about to commence and the Conference and Event facilities will undergo refurbishment in the coming months. Queensland Minister for Tourism, Major Events, Small Business and the Commonwealth Games Jann Stuckey welcomed news that the event would celebrate its 25th anniversary on the Gold Coast. “The Volvik RACV Ladies Masters brings an international flavour to the Gold Coast’s dynamic event calendar, showcasing the Gold Coast and Queensland to over 120 million households across the globe,” said Minister Stuckey. “The Queensland Government is proud to continue supporting this event through Tourism and Events Queensland as part of our goal to double overnight visitor expenditure from $15 billion to $30 billion by 2020. Please visit www.ladiesmasters.com for further information. 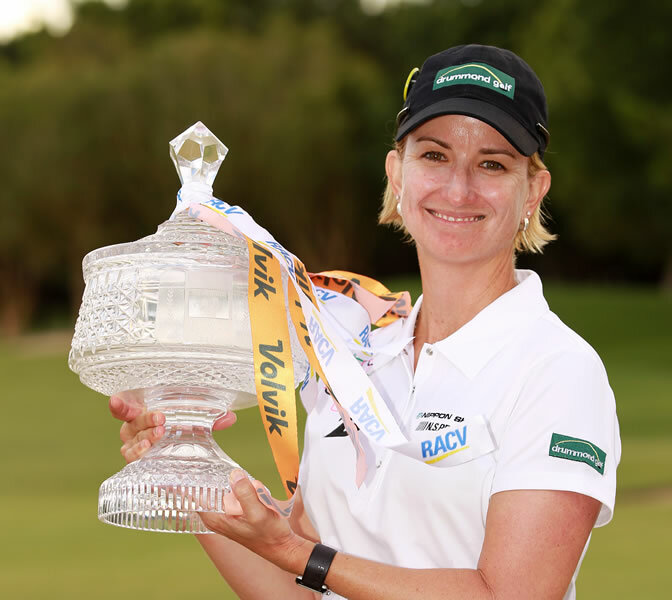 Australian Karrie Webb has won the Volvik RACV Ladies Masters for an incredible eighth time and in doing so she equals Sam Sneads record of winning the same event eight times. Snead won the Greater Greensboro Open eight times in a run spanning four decades. Webb first won here in 1998 and her most recent victory was 2010. Webb, who started the final round two shots behind teenagers, Su-Hyun Oh and Ariya Jutanugarn, fired a flawless round of five under par 67 to finish at top of the leaderboard at 13-under-par and two clear of the field at the RACV Royal Pines Resort on the Gold Coast. Webb, didn’t feel it for the first nine holes and posted her only birdie on the par 5 3rd to go out in 35. Webb was still trailing the leaders by three with eight holes to play, but the seven-time major champion then stepped it up a gear over the final holes, she made a crucial birdie on the par 5 12th moved her to 10-under-par. After Webb made her birdie on the 12th, Oh, who was leading, was starting to feel the pressure and a double bogey on the same hole saw her drop back to 10-under-par. The 12th wasn’t a good hole for the players at the top apart from Webb,Jutanugarn also bogeyed which resulted in Webb, Oh and Jutanugarn all at 10-under-par. Webb took the outright lead after she holed her pitch shot from the back of the green on the par 3 14th for another birdie. The reachable par 5 15th gave her another birdie opportunity, she reached the green in two and just missed her eagle putt, but tapped in for birdie to move to 12-under-par. A fantastic up and down from the right side of the par 16th maintained her momentum and lead before she sunk another 15 foot birdie putt on the 17th to give herself a three shot lead heading up 18. On her eighth win she responded “I am very happy, it never gets old when you get a win, what a way to start the year, I’m very happy”. Three players finished at 11-under-par South Korean Chella Choi (69) and the two teenagers who share the lead in the final round, Australian amateur Su-Hyun Oh (71) and Thailand’s Ariya Jutanugarn (71). American Jessica Korda (71) finished outright fifth, while Australian Stacey Keating (72) was sixth at nine-under-par. Swede Pernilla Lindberg (72) and American Dori Carter (72) were a further shot back and tied for seventh. Defending champion Christel Boeljon didn’t have a great final round and finished the tournament at seven-over-par and tied for 53rd. 16-year-old Australian amateur Su-Hyun Oh will calm her nerves by eating cookies and cream ice-cream as she shares the lead heading into the final round of the Volvik RACV Ladies Masters being played at the RACV Royal Pines Resort in Queensland. Oh carded an impressive eight-under-par 64 and sits atop of the leaderboard at 10-under-par with rookie Ariya Jutanugarn (65) from Thailand. American Jessica Korda (68) and Australian Stacey Keating (67) are just one back, while another Australian and seven-time Masters champion Karrie Webb (66) and South Korean Chella Choi (67) are right in contention at eight-under-par. American Dori Carter (69), Swede Pernilla Lindberg (67) and first round leader Alison Walshe (71) share seventh position at a further shot back. Oh, who was out early, fired a superb bogey free round. She recorded birdies on the 3rd, 4th, 7th and 8th holes to go out in 32. The Victorian then birdied the par 5 12th and 15th holes before finishing off by sinking a 15 foot eagle putt on the par 5 18th. She explained the difference between her first and second rounds was better placement with her approach shots. While 17-year-old Jutanugarn, who is playing in her first LET event as a professional, carded eight birdies and one bogey in her round of 65. “It was a very good round. Today my putting helped me a lot but I still missed some at three feet.” She commented after her round. The players at the top will be looking out for Webb, the World Golf Hall of Famer is looking to equal Sam Snead record of eight tour wins at same event. The seven-time major champion is very happy with her position and round today. “I got off to a great start, which was good. There was a little lull there through the middle but a nice finish. Two shots behind. When I teed off 10 under was leading, so I thought if I could get within three or four of that I’d have a good shot tomorrow. So 66, I’m really happy with that.” Webb said. Korda will be looking to add another Australian tournament win to her ISPS Handa Women’s Australian Open she won last year, while Keating will be looking for her first major tournament victory on home soil. The cut was made at two-over par and 60 players will contest the final round. The defending champion, Christel Boeljon is well off the pace at one-over-par. American Alison Walshe sits atop of the leaderboard after the opening round of the Volvik RACV Ladies Masters being played at the RACV Royal Pines Resort on the Gold Coast. On a sunny day Walshe, who was out in one of the last groups, surged to the top with a flawless round of six-under-par 66. The 27-year-old holds a slender one shot advantage of fellow compatriot Jessica Korda, who was at the top of the leaderboard for the majority of the day after teeing off early. Australian Stacey Keating, Spain’s Belen Mozo, Thailand’s Nontaya Srisawang and American Dori Carter are at four-under-par, while South Korean Chella Choi, Sweden’s Daniela Holmqvist and rookie Ariya Jutanugarn from Thailand share seventh position a further shot back. A group of 12 players sit at two-under par and are right in the mix, including seven-time Masters champion Karrie Webb, the French pair of Gwladys Nocera and Joanna Klatten and Australians Bree Arthur, Kristie Smith, Nikki Campbell and amateur Minjee Lee. Walshe started her round on the 10th tee parred her first five holes before rattling off four straight birdies to go out in 32. The 27-year-old then birdied the 3rd and 8th holes to post an inward 34. Korda, the defending ISPS Handa Women’s Australian Open champion, also posted a bogey free round. The two-time LET winner was happy with her opening round of 68 since she was struggling with her driver. Mozo was battling with illness during her round, said it actually helped her focus more and was very happy with her score. Defending champion Christel Boeljon opened with a one-over-par 73 to be tied for 47th position. Other notables in the field include Rolex World No. 7 So Yeon Ryu and South Korean Jiyai Shin, both shot 71, while three time winner of the event, England’s Laura Davies posted a 76. Cheyenne Woods carded a 74. The cut will be made to the top 50 professionals and ties after the second round. World Golf Hall of Famer Karrie Webb is feeling refreshed and keen to start 2013 off right foot by adding another Volvik RACV Ladies Masters trophy to her collection of wins. Webb, who won the Masters an incredible seven-times, will be vying for number eight come Sunday afternoon at the RACV Royal Pines Resort on the Gold Coast. The 38-year-old went winless for the first time in her illustrious career in 2012, but for her, it was one of her most consistent years in recent times. In 2012 on the LPGA she posted seven top 10 finishes including a runner-up finish at the Evian Masters and finished the year 12th on the LPGA Money List with US$884,973. "That was probably the only disappointing part for me but I felt I ended the season really well, which normally the last three or four events I sort of can't wait to be done. I felt really good. I mentally felt fresher than I had in past years at the end of the year, so that really excited me for the start of this year." The 38-year-old missed her first Ladies Masters in 2012 and when asked if she felt pressure about playing again this year she responded "I did feel pressure to play this year but I also have so many great memories here, of the lowest 72 hole score I've ever had in a tournament I've done twice here. My lowest career round was here – as well as somewhere else -- but here as well." "There are a number of great memories that I have here and also those memories I share with my family. It's a great place for me to come. When I was younger choices were easy, I just chose golf all the time; now it's family, golf; so it's a hard decision. I was going to be up in North Queensland anyway and my two sisters and their kids decided they'd come down, so really that ultimately made that decision easier for me because I didn't want to miss spending time with them." Another popular player this week is Cheyenne Woods, Tiger's niece. Woods had a couple of issues with her passport and didn't arrive on the Gold Coast until Wednesday but that hasn't dampened her enthusiasm. "I've always wanted to come to Australia so I'm excited to start playing out here. I've heard it's beautiful and hopefully I'll be able to see it these next few days. But my expectations, I just hope to start my season off very strongly." Woods turned pro just over six months ago and was chatting about the transition from amateur golf to the professional ranks. "I've definitely learnt a lot in that transition from collegiate golf and amateur golf to professional. It's been a great experience being able to travel the world and play in two LPGA majors so far. I've learnt a lot, trying to learn from the players that I'm surrounded by each week. Each week I just take it as a new experience and continue to grow my game." Being known as Tiger Woods niece doesn't faze the young American "I think I'll always kind of have that title because Tiger Woods has been Tiger Woods for a long time. He's a very elite athlete; he's up there with the Michael Jordan's of the world, so I think that me coming up in the exact same profession will always kind of have me with that title of being his niece. I accept that; I understand it. But I'm excited for my own career. I'm excited for this year on the European Tour and to have my very first season out here as a professional." Woods tees off at 12.30pm tomorrow with South African Lee-Anne Pace and Thailand's Ariya Jutanugarn. Webb starts her campaign at 7.30am with fellow compatriot Stacey Keating and Rolex World No. 8 Jiyai Shin. The weather is clearing and the players are ready to tee it up in the Volvik RACV Ladies Masters being played this Friday to Sunday at the magnificent RACV Royal Pines Resort on the Gold Coast, Queensland. Defending champion Christel Boeljon is excited to back at the course she triumphed at 12 months ago. "There are definitely good vibes coming back to a course you've done well at." Boeljon said. Over the last few days, she has also spoken about overcoming dealing with a stalker during 2012 on the LPGA tour and then in Europe. 2012 LET Player of the Year, Spain’s Carlota Ciganda is looking forward to her second year and what it will bring. Another high calibre field has been assembled for the opening event of the 2013 LET season, Australia’s Karrie Webb is the favourite having captured the title an incredible seven times. She is joined by the likes of Boeljon, Ciganda, England’s Laura Davies, Australian Katherine Hull-Kirk and Stacey Keating, Swedes Sophie Gustafson and Caroline Hedwall and South Koreans Jiyai Shin and So Yeon Ryu. The draw has been released and some of the notable first round morning pairings include: Webb, Shin and Keating, followed by Australian Kristie Smith, Hedwall and defending ISPS Handa Women’s Australian Open champion American Jessica Korda. Ciganda, is paired with Australian Sarah Kemp and American Ryan O’Toole. In the afternoon tee times for Friday, Ryu, Hull-Kirk and Davies are paired together, while defending champion Boeljon is paired for the first two days with South Korean Chella Choi and Australian Emma De Groot. South African Lee-Anne Pace, Thailand’s Ariya Jutanugarn and American Cheyenne Woods are another feature group and tee off at 12.30pm. "I am very pleased that I am returning to RACV Royal Pines where I have so many great memories in the past" Webb said. "My nieces and nephews will be joining me so I look forward to some good golf and time on the beach on the beautiful Gold Coast and all that it has to offer." Tournament Chairman, Bob Tuohy announced today Korean golf ball manufacturer Volvik would join RACV as the Co-Title Sponsor for the 2013 Volvik RACV Ladies Masters, scheduled to be played at the RACV Royal Pines Resort between February 1-3, 2013. RACV Managing Director and CEO, Colin Jordan, welcomed Volvik as the co-title sponsor and event partner, and was delighted that RACV Royal Pines Resort would host the Ladies Masters for the twenty-second consecutive year. Bob Tuohy acknowledged the ongoing support of long term key stakeholder Events Queensland and the Gold Coast City Council. Events Queensland supports the 2013 Volvik RACV Ladies Masters as part of a growing calendar of sporting, cultural, business and regional events throughout the state. The Volvik RACV Ladies Masters will be telecast by ABC Sport nationally each day with live pictures broadcast in Korea by J Golf, Sky NZ, ESPN Star Sports Asia and other key overseas markets. Dutchwoman Christel Boeljon won the 2012 Gold Coast RACV Ladies Masters by one shot in dramatic fashion. Starting the day three shots behind South Korean So Yeon Ryu, Boeljon held her nerve all day and critically on 18 when she sunk her 1.5m putt for the victory. Boeljon posted a solid four under 68 to take the title over Ryu, who shot even par 72, and the fast finishing duo of Italian Diana Luna and South Korean Ha Neul Kim. All three completed their tournament on 20 under. Two days earlier the talk at Royal Pines was who was going to catch Ryu, after the reigning US Open champion fired off an eleven under 61 giving her a commanding four shot lead heading into the weekend. But the 21-year-old, who admitted to being tired after her 61, struggled over the final 36 hole stretch posting just seven birdies and four bogeys in the last two rounds. 24-year-old Boeljon however remained composed throughout. Playing with new clubs this week, Boeljon shot four under yesterday and did the same today, not once appearing intimidated by Ryu's credentials or the situation. Sharing the lead with Ryu down the final stretch, the Dutchwoman was able to make two brilliant up and downs on holes 15 and 16 to importantly stay in the lead with the South Korean. Again as she headed up 18 there were four players all on 20 under, and Boeljon knew a birdie on the final hole would do it. After reaching the green in two and with Ryu in the greenside trap, Boeljon left her eagle putt 1.5 short. "My first putt I was not really happy, it was a bit far away for my liking,"" she told ABC TV. Ryu flew her bunker shot way over the pin leaving her a very long birdie putt. "I was better make a two putt and birdie and then it might be mine," Boeljon said. "It's not over till it’s over. I am really happy I finished with a birdie and it’s unbelievable." After yesterday’s exciting eleven under round, it looked like South Korea’s So Yeon Ryu would run away with the Gold Coast RACV Australian Ladies Masters but no one told that to her main chaser, the Netherlands Christel Boeljon. Even though Ryu opened up a five shot lead over the Dutchwoman early in today’s round at Royal Pines, Boeljon remained patient and was able to capitalise when the normally solid South Korean blinked on nine with a bogey. Boeljon then applied the pressure on the back nine with two great birdies on holes 11 and 12, while Ryu’s flat stick suddenly went cold and her irons into the greens weren’t quite as radar like as yesterday. But a late birdie on 17 gave Ryu some breathing space and after the pair birdied the par 5 18th , it was Ryu leading by three shots following a three under 69 today. She is on 20-under-par and could quite possibly give Karrie Webb’s 26 under record a shake tomorrow. Boeljon, playing with new clubs, shot a very impressive four under 68 and will not be intimidated when the pair play again tomorrow in the final grouping. Ryu’s compatriot, Ha-Neul Kim put herself in with a chance with an eagle on the 18th giving her an eight under 64 for the day. The 2011 Korean LPGA Player of the Year is five shots off the lead in a share of equal third with Italian Diana Luna, both sitting on 15-under-par. Sydney’s Frances Bondad was the big mover of the day, leaping up the leaderboard to be in outright fifth place following a brilliant nine-under-par 63. It is her best round as a professional, having once shot that score as an amateur. “I’m really happy with that,” she said. The 24-year-old is playing with renewed confidence following her win late last year on the Ladies European Tour and was surprised to see her back nine score. “Oh wow,” she said when she saw it for the first time post round on ABC TV. Bondad, with European Tour player Breanne Loucks on her bag, ripped the back nine apart with six birdies on her final seven holes and not surprisingly shot the round of the day at Royal Pines. Bondad is on thirteen under for the tournament, just one shot ahead of fellow Australian Nikki Campbell and South Korean Bo- Mee Lee, while England’s Felicity Johnson and America’s Amelia Lewis are one stroke further back on 11-under-par. Teenagers, 16-year-old Lexi Thompson and 14-year-old amateur Lydia Ko didn’t play together today but are separated by just one shot. Ko had her most consistent round of the tournament to shoot another three under 69 and finds herself tied in 16th position on eight under 208. It is an outstanding performance from the Kiwi youngster to back up from last week, when she created history by becoming the youngest player, male or female, to win a professional tournament, the Bing Lee Samsung Women’s NSW Open. Her aim this week was to make the cut but it has now been revised to recording a top ten finish. The plucky youngster is only two shots off that goal. After a frustrating day with the putter, Lexi Thompson posted an even par round today and sits on 7-under-par and in tied 19th place with four other players including Australians, Stacey Keating and Stephanie Na. Italy’s Giulia Sergas and France’s Gwladys Nocera round out the top ten on 10-under par. South Korean So Yeon Ryu soared to the top of the leaderboard after firing an incredible 11-under par 61, which included 12 birdies and one lone bogey at the Gold Coast RACV Australian Ladies Masters. The reigning US Open Champion Ryu set two records at the RACV Royal Pines Resort today but unfortunately neither feat will be given official status. Due to the soaking the course has received over the past week, players have been able to take preferred lies on the closely mown areas, and the altered playing conditions means the records won’t stand. Ryu’s first record was equalling Queensland’s Karrie Webb’s outstanding round of eleven-under-par 61 and her second was posting the lowest 36 hole score of seventeen under 127 on the Ladies European Tour (LET). The Gold Coast RACV Masters is co-sanctioned with the LET. ”I really wanted to change the number, finally I can change the number,” she said. Lack of official recognition aside, it was a remarkable score by the 21-year-old who could have shot one shot less had she not bogeyed her second hole of the day. Still it was enough to give her a sizeable four shot lead over Dutchwoman Christel Boeljon who is on thirteen under 131, heading into the weekend. Boeljon finds herself in outright second courtesy of a blistering birdie, birdie, eagle finish. The 24-year-old sunk a 15-metre eagle putt on the 430m par 5 18th to end her round in style. “It’s a great feeling, great way to end my round, so you know, what do you do? You take it every day,” she said. After four attempts, Boeljon has finally made the cut at Royal Pines and said experience on the greens was the key. “In the previous years, I’ve always had a little bit of trouble on the greens, always had too much break and it showed,” she said. Australia’s Nikki Campbell had another strong round, again firing a five under 67 to share third place with Ryu’s compatriot Bo-Mee Lee on ten under. The duo is one shot ahead of Italian Diana Luna, American Amelia Lewis and England’s Felicity Johnson who are on 9 under. Queenslander Bree Arthur is the next best placed Australian in outright 8th position on eight under. The teenage duo of 16-year-old Lexi Thompson and exciting amateur, 14-year-old Lydia Ko, continued to wow the crowds today. Ko recorded a three under 69 but was again left to rue two bogeys in her round. Yesterday she carded three but today she at least took the honours over playing partner Thompson. Ko’s 69 has her in a tie for 18th with a host of players including Australian Stephanie Na at five under under 139. Thompson’s two under 70 today sees her in a share of 9th place on seven under 137. 2009 Ladies Masters champion Katherine Hull will be missing from the weekend after finishing on even par with Perth’s Kristie Smith. The pair finished one shot below the cut line. England’s Melissa Reid is another big name to miss the next two days, while Laura Davies and 2011 Kraft Nabisco Champion Stacy Lewis just scraped in on one under. Earlier in the day, the playing group of Corie Hou, Inhong Lim and amateur Annie Choi were disqualified from the tournament for a rule breach. The trio were playing preferred lies through the green instead of on closely mown areas only. All admitted to breaching this rule yesterday and were then immediately disqualified after being questioned on the 2nd tee today. South Korean Bo-Mee Lee holds a one shot advantage after a flawless opening round today at the Gold Coast RACV Ladies Masters being played at Royal Pines. The 23-year-old fired a bogey free seven-under-par 65 to lead fellow South Koreans, So Yeon Ryu and Hee Kyung Seo and Christel Boeljon from the Netherlands, who are tied in second one shot back. Lee, who was the Korean LPGA player of the Year in 2010 now plies her trade on the Japanese circuit, said today's round was one where everything just worked. "Good driver, good irons, putting was good. It was easy, easy today," she said. Ryu shot a bogey free six under 66 and admitted to being nervous at the start of her first tournament for 2012 but said a birdie on her third hole of the day, the 501m par five 12th hole, settled her down. "I sunk my birdie putt and then I can finally relax," she said. "I think it was a really great round. It was a really lovely day for me." The 2011 US Open champion said her early round nerves was brought on by the pressure to perform. "A lot of people have really high expectations for me so I am a little bit worried about it," she said. "I really try hard and I am really training hard but if I hit it bad, a lot of people are disappointed for me." The 21-year -old added she was pleasantly surprised at the state of the Royal Pines layout given it has been soaked by relentless rain for the past week. "I can't believe it because yesterday the course was too wet but today it was a lot better." Australian Nikki Campbell was pleased with her opening round of five-under-par 67 after a difficult year on the Japanese Tour in 2011. "I felt that the second half of last year, I was just going through the motions and not there to compete," she said. "I struggled a bit, and I just felt really lonely." After a long break from the sticks Campbell, who finished second at Royal Pines last year, said she was happy with her opening round. "I probably had a few loose shots coming in, but that didn't lose me anything," she said. "I think if you have a good round, you have a few things go your way, so that was nice." It was a bogey free round by Campbell who is joined by fellow Australian Stephanie Na, England's Felicity Johnson and American sensation Lexi Thompson in a tie for 5th. It was Thompson who won the battle of the teen queens pairing today, the 16-year-old professional shading the 14-year-old amateur Lydia Ko, with a five under round of 67 to Ko's two under 70. The New Zealand world amateur number one who created history last week by becoming the youngest winner of a professional tournament, did well to back up after last weeks' Bing Lee/Samsung Women's NSW Open victory. It was a grinding round of five birdies and three bogeys, a five on the final hole, the difficult long par 4 9th, ending her day on a sour note. The likeable teenager has stated her aim this week is to just make the cut, a prospect that looks good after her first round which left her in a tie for 23rd. Australian Kristie Smith, the third player in that grouping struggled around the course with a two over round of 74 and sits in a tie for 97th. Sitting just three shots off the lead on 4 under 68 is the Australian trio of Frances Bondad, Sarah Kemp and Courtney Massey. Of the other notables in the field, France's Gwladys Nocera is in a tie for 12th on 3 under with Christina Kim, while 2009 Masters Champion, Katherine Hull is on 2 under 70 with 2011 Kraft Nabisco Champion, American Stacy Lewis, while three times Masters winner, Laura Davies, is a shot further back on one under 71. The weather is expected to hold for the next three days and with a drier course expect some even lower scores at the Gold Coast RACV Ladies Masters tomorrow. It will be a case of the young guns versus the established stars when the 23rd Gold Coast RACV Ladies Masters tees off this week at Queensland’s Royal Pines Golf Course. The youngest player to win a professional tournament in history, New Zealand’s 14-year-old amateur Lydia Ko and 16-year-old USLPGA winner, Lexi Thompson will take on the old guard of past Masters winners, Queenslander Katherine Hull and England’s Laura Davies. They will be joined by a strong list of international stars including two of last year’s Major Winners, US Open champion So Yeon Ryu and the 2011 Kraft Nabisco victor Stacy Lewis. Also teeing it up will be one of last year’s finds, the Ladies European Tour Player of the Year and Rookie of the Year, Caroline Hedwall. 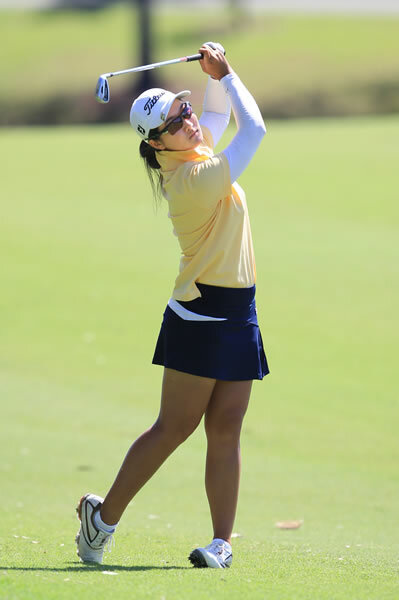 Korean Ryu is competing in her fourth Gold Coast RACV Ladies Masters and is looking forward to a strong showing in her first outing for 2012. “I really like this golf course, because I feel really comfortable,” she said, adding that the constant rain will make the course a bit tougher to play. For the first time in many years, the Ladies Masters will be without seven time winner, Karrie Webb, leaving Katherine Hull to carry the baton as Australia’s main hope. “She has dominated here for sure so it’s one less we have to worry about and look out for this week,” Hull, the 2009 Masters champion said. Hull will have fellow Aussies, Karen Lunn, Lindsey Wright, Frances Bondad, Rebecca Flood and reigning New Zealand Open Champion Kristie Smith to help lead the Australian charge. Teenage phenom Lexi Thompson is hoping to add the 2012 Gold Coast RACV Ladies Masters to her growing list of achievements. The 16-year-old became the youngest to win on the USLPGA Tour when she ran away with the Navistar Classic in September, finishing five ahead of fellow American Tiffany Joh. She then became the youngest professional player to win on the Ladies European Tour when she took out the Ladies Dubai Masters in December last year. This is Thompson’s third trip to Royal Pines but she is a little unsure of her game at the moment after a six-week break from the game. “That is definitely along break for me. I just practiced a lot, I just played against my brothers, had our competition to keep myself busy,” she said. Thompson and Ko’s respective parties had arranged for them to play a practice round late Monday, but due to the course being closed they couldn’t meet. Ko, was very excited to meet one her idols. In will in fact happen during the first two rounds, Ko, Thompson and Kristie Smith are paired together. They tee off at 11.50am. Other feature groups include Katherine Hull, Stacy Lewis and Melissa Reid, who tee off at 7.10am, while three time champion Davies is playing with Ryu and Sophie Gustafson are the group following at 7.20am. The Royal Pines course has been lashed by relentless heavy rain but everything is on track for Thursday start. US Women’s Open champion So Yeon Ryu is heading to the Gold Coast for the RACV Australian Ladies Masters from 2 to 5 February. 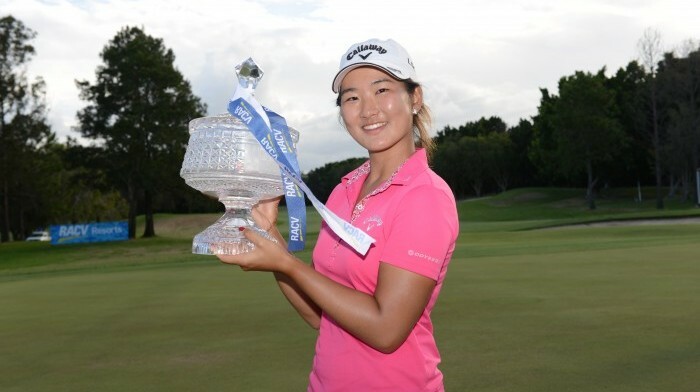 The 21-year old from South Korea has confirmed she will be joining fellow 2011 major championship winner American Stacy Lewis and teenage sensation Lexi Thompson, in what is shaping up to be another thrilling event with an array of talented players from all around the world converging on the RACV Royal Pines Resort. Since turning pro at the end of 2007 Ryu has been playing at home on the KLPGA tour. In just three short seasons she has made a name for herself having won an impressive seven times. However, in July this year Ryu made a name for herself worldwide by becoming a major champion on the LPGA tour. Ryu, won the 66th US Women’s Open at The Broadmoor East Course in Colorado Springs when she defeated compatriot Hee Kyung Seo in a three-hole aggregate playoff. Both players finished the regulation 72 holes at 281 (-3), two shots ahead of American Cristie Kerr. It isn’t the first visit to the Gold Coast for the gifted player, in fact she finished runner-up in 2009 to Katherine Hull and in 2010 finished outright fifth behind seven time champion Karrie Webb. 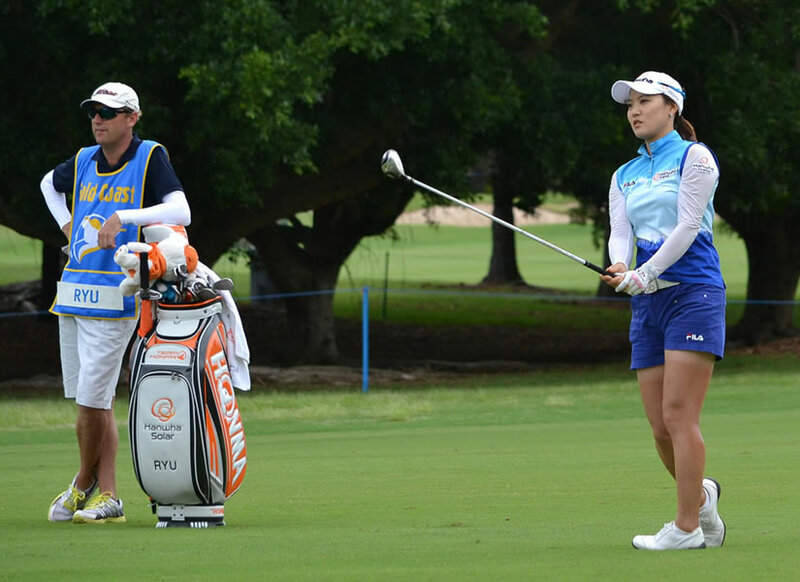 Ryu said of her return “It is great to be going back, I enjoy visiting the Gold Coast and playing in the Australian Ladies Masters at RACV Royal Pines Resort”. Another 2011 LPGA tournament winner and fellow South Korean Hee Young Park will be joining Ryu at the Gold Coast. The 24-year old had displayed her prodigious talent on numerous occasions in her four years on the LPGA tour by shooting low rounds, but hadn’t been able to quite break through for her first victory. However that changed at the LPGA’s season ending CME Group Titleholders where she put it all together for four rounds. Park carded rounds of 71-69-69-70 to finish at 9-under 279 for a two-stroke victory over American Paula Creamer and Germany’s Sandra Gal, both finishing at 7-under 281. “I am looking forward to playing the Masters. I have played this event before, and I love the Gold Coast lifestyle. In the past I have spent a lot of time on the Gold Coast at training camps. I like the Royal Pines layout for me.” said Park from her Orlando base. The Gold Coast RACV Australian Ladies Masters will be broadcast live throughout Australia on ABC1, on Saturday 4 February from 2:00pm to 6:00pm and Sunday 5 February from 1:00pm to 6:00pm. Major championship winner Stacy Lewis and American teenage sensation Lexi Thompson are leading the way “back to the future” at next year’s Gold Coast RACV Australian Ladies Masters at Royal Pines. The 2012 event will be played from 2nd to 5th of February. In the first of several player announcements, Tournament Chairman Bob Tuohy was thrilled to confirm that Lewis and Thompson will be teeing it up. Rolex World No. 10 Lewis has enjoyed a phenomenal year. She made her first LPGA tournament win a major championship, when she went head to head with current Rolex World No.1 Yani Tseng. Lewis played a magnificent final round to win by three and capture the prestigious Kraft Nabisco Championship. The 26-year old recorded another 11 top 10 finishes from 23 starts, including two runner-up finishes at the Evian Masters and Canadian Women’s Open. She finished 2011 in fourth position on the LPGA Money List with US$1,356,211. 16-year-old Thompson is one of the hottest players in world golf, having broken through for her first professional victory in September at the Navistar LPGA Classic. In doing so she became the youngest ever winner in the history of the LPGA Tour. Thompson celebrated her 16th birthday at last year’s Ladies Masters and is looking forward to returning again in 2012. 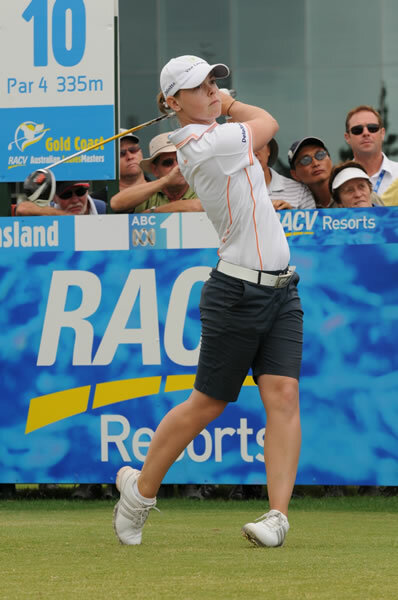 "I am so excited to return to the beautiful Gold Coast, and start my year off at the 2012 RACV Australian Ladies Masters. I appreciate the opportunity to come down and play a great golf course with a fantastic sponsor, volunteers, and fans. It is truly going to be an amazing event!" Another young gun, Spaniard Belen Mozo is a definite starter. Mozo enjoyed a successful amateur career, becoming the first player since 1972 to win both the Women's British Amateur Championship and British Girls Amateur Championship. While at the University of Southern California she was a four-time NCAA/All-American. She qualified for the LPGA at her first attempt and played in 15 events this year, her best finish was 5th at the Walmart NW Arkansas Championship. Recently turned local professional Courtney Massey will be also vying for her place in the prestigious event. Massey, from Southport, turned professional a couple of months ago and is trying to play her way into the Ladies Masters. If she is one of the Top-10 money earners on the ALPG money list at the end of the Bing Lee/Samsung Women’s NSW Open, not all ready exempt into the tournament, she will get a chance to play in front of family and friends. The Australian contingent will be led by 2009 Ladies Masters Champion Katherine Hull and 2011 runner-up, Nikki Campbell. Three-time winner England’s Laura Davies has already confirmed her entry for the 20th consecutive time. Davies who has won 79 titles worldwide, enjoys coming Down Under where she will again spend three weeks competing in ALPG tournaments ahead of the RACV Royal Pines Resort event. Queensland Premier Anna Bligh looked forward to welcoming the international golf stars to the State in 2012. More player announcements will come in coming weeks. TA Golf, Event Organisers of the RACV Australian Ladies Masters on the Gold Coast announced the tournament would be played at the RACV Royal Pines Resort, Gold Coast between February 2-5, 2012 under co-sanction status with the Ladies European Tour (LET) and Australian Ladies Professional Golf (ALPG). In making the announcement Tournament Chairman, Bob Tuohy said, he was excited with the outcome which positions the Gold Coast as the headline location for the RACV Australian Ladies Masters in the week prior to the LPGA/ALPG sanctioned Handa Australian Women’s Open, therefore ensuring the sisters of swing will return to the Gold Coast for the 23rd staging of the event. Sustaining the long running ALPG Tour event has been made possible through the ongoing commitment of major partners, Events Queensland and RACV. Mr Sevil expressed his gratitude on behalf of the co-sanction partners. “ALPG and LET are extremely grateful to both Events Queensland and RACV, both of who have stepped up their commitment to guarantee this iconic Queensland event will continue and hold its reputation as one of the high profile and most popular events on women’s golf international schedule. Together with TA Golf, who have been our greatest supporters over the years, we look forward to delivering another world class event complete with a long list of the world’s best players. Queensland Premier Anna Bligh said the event will put the spotlight on the Gold Coast as a great holiday destination. 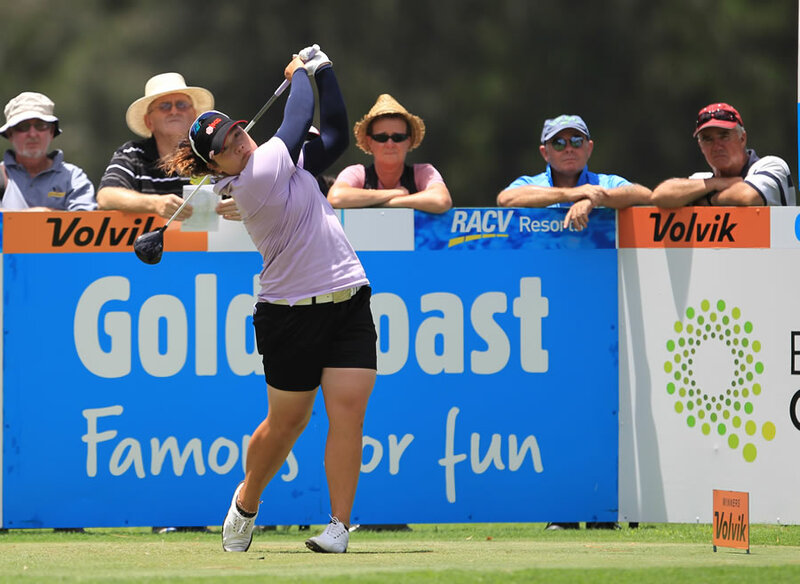 “The Gold Coast RACV Australian Ladies Masters will be broadcast to key tourism markets including Korea, Japan and New Zealand – showcasing the Gold Coast region to a national and international audience,” said Ms Bligh. The RACV Australian Ladies Masters will be broadcast from the Gold Coast by ABC Sport, live throughout Australia, on Saturday 4 February between 2:00pm to 6:00pm and Sunday 5 February between 1:00pm to 6:00pm. The international reach of the event is 160 million households in over 190 countries. TA Golf will announce the Sisters of Swing line up during the first week of December. Taiwan's Yani Tseng shot a closing 68 to win the ANZ RACV Ladies Masters at the Royal Pines resort and claimed the world No. 1 ranking from Korean Jiyai Shin. Tseng, 22, who has played the Ladies Masters on Queensland's Gold Coast since she was a 16-year-old amateur, produced rounds f 67, 66, 63 and 68 against par of 72 to finish at 24 under par, four shots clear of Australia's Nikki Campbell and American Stacy Lewis. Another American, Ryann O'Toole, took third place at 18 under while 16-year-old New Zealand Amateur Cecilia Cho tied for fifth with Lee-Anne Pace of South Africa, Amanda Blumenhurst of the US and Aussie Sarah-Jane Smith. The win comes on the heels of the Women's Australian Open at Commonwealth GC in Melbourne last week, a double achieved only by Karrie Webb in 2000 and 2007. Webb was looking to win the title for the eighth time this year but after sharing the lead with an opening 66, shot subsequent rounds of 71, 68 and 67 to drop back to a share of ninth place. Tseng's elevation to the top spot in the rankings is almost routine for to the Ladies Masters. Others to use the tournament as a springboard to No. 1 are Webb, Annika Sorenstam and Lorena Ochoa. The winner of three majors - the 2009 LPGA Championship and the Kraft Nabisco and British Open in 2010 - said her goal at the start of the year was to be ranked the best player in the world. She advanced from No. 5 to No. 2 with the Australian Open win and completed the journey at Royal Pines. The trick now, she says, is staying there. Since Ochoa retired on top in May last year, Shin, Ai Miyazato of Japan and American Christie Kerr have assumed and lost the mantle. "It is so soon," said Tseng. "I wasn't expecting it as quickly as this. I still have another 10 months to go. I just need to be very patient and keep working hard." She described the win as a dream come true. "I'm very appreciative of the opportunity to play in this tournament since I was an amateur," she said. "I have learnt a lot here, coming to play with the best golfers in the world. The first time I came here I told all my friends that one day I want my picture on Champion Drive with all the other winners." The circuit now moves to Christchurch in for the Pegasus Women's New Zealand Open, the third event in as many weeks co-sanctioned by Australian Ladies Professional Golf and the Ladies European Tour. Taiwan's Yani Tseng surged to a commanding 3-shot lead after firing a superb bogey-free 9-under par 63 during the third round of the ANZ RACV Ladies Masters being played at the RACV Royal Pines Resort on the Gold Coast. On another fine day, the Rolex World No.2 posted 9 birdies in her flawless round to sit at 20-under par. The three-time Major winner got off to a flying start posting birdies on the first three holes, before posting another on the 9th to go out in 33. Another five birdies on the way in saw her come home in 30. She was very happy with her performance, saying, "It's really exciting because my putting is much better than yesterday and I just figured out something before I went out to play. I figured I was standing too far away yesterday and today I tried to get closer and it worked really well." When asked about how she will approach tomorrow she replied "I will just enjoy myself and enjoy the crowd and shoot lots of birdies too." The ISPS Women's Australian Open champion's closest challenger is American Stacy Lewis. Lewis, who started the day as co-leader with young Australian Kristie Smith birdied three of her last four holes to stay in contention. She posted a 5-under par 67 to be at 17-under par. Outright third at 15-under par is young American Ryann O'Toole, the 22-year old posting a 5-under par 67 including back-to back birdies on 17 and 18. South African Ashleigh Simon (68) sits in fourth position a further shot back. At 13-under par and tied for fifth is Spain's Belen Mozo, who carded a stunning 8-under par 64 and American Jennifer Song (67). Eight players share seventh position at 12-under par including flamboyant American Christina Kim (66) and Australian Nikki Campbell (69). Defending champion Karrie Webb will have to produce something special to lift the trophy for an eighth time. She had a better day today posting a 4-under par 68 to be at 11-under par and tied for 15th. She was buoyed by the fact it was a better day, "I guess a little better than yesterday, still very up and down, inconsistent. A perfect example, I hit it to two feet on 16, great iron shot and a good drive. Hit it to two feet on 17 and then snap hooked it off the tee at 18." If Tseng wins she will be the only the second player to win the Women's Australian Open and Ladies Masters titles in the same year. Webb won both tournaments in 2000 and again in 2007. The tournament record of 26-under par from 2010, which is currently held by Webb is also under threat in the final round. American Stacy Lewis and Australian Kristie Smith take a narrow lead in into the third round of the ANZ RACV Ladies Masters after shooting identical rounds of 67 and 65 at the Royal Pines resort on Queensland's Gold Coast. This left them at 12 under par and a shot clear of world No. 2 Yani Tseng who left the course frustrated despite shooting a bogey-free 66 against par of 72. On a day of low scoring in near perfect conditions, a further six players - Ashleigh Simon of South Africa, Sandra Gal of Germany, Shin-Ae Ahn of Korea, Melissa Reid of England, Ryann O'Toole of the United States and Maria Hernandez of Spain - moved to 10 under par and shared fourth place. Lewis, who finished in eighth place when she played here for the first time in 2010, got her morning round going with a a birdie at the first hole and an eagle at the third and held the lead until caught by Smith late in the day. An indication of the hot scoring was defending champion Karrie Webb starting the day tied in the lead at six under. By the time she had dropped a shot on the eighth hole, she was languishing in 41st position. She rallied with a couple of late birdies in a round of 71 but found herself five shots off the pace in 25th place. Further evidence of the hot scoring was that he cut was made at four under par 70, the lowest in the tournament's 22-year history. Tseng, who will take the world No. 1 spot from Jiyai Shin of Korea if she wins this week, was angry at what she saw as missed chances. "It was a long day for me," she said. "I was pretty stressed out on the course because I could not make any putts. I made most of my birdies on the par fives. "However, I hung in there. I feel I could have shot 10 under. I was proud of myself for finishing at six under." The low round of the day was a scorching 63 from American Mollie Frankhauser who made nine birdies in the morning without dropping a shot. After an opening 74 it left here at seven under and five shots from the lead. The quality of her golf - a shot outside Webb's course record of 62 - was not the only thing that caught the attention of the local media who had not seen a heavily tattooed golfer, male or female, in the professional ranks. She was happy to talk about it, saying that they started about five years ago when her aunt and uncle bought her one on her neck as a birthday present. "It was encouraged by all my family members so I just went with it," she said. "I'm the only tattooed person in my family. I think they are beautiful if they are done by the right person. They can be horrendous and ugly but I have taken great care and researched the right artist." The tattoos are evident on her arms and she says she has more on her chest and elsewhere. Webb's quest to win the title for the eighth time received a severe set-back but few who have seen her previous seven victories here would write her off completely. Five shots is not a lot to make up in two days, especially in light of her closing 61 last year to win by six shots. Compatriot Katherine Hull, who won in 2009 and was runner-up last year, is also nicely placed if the leaders falter. Rounds of 69 and 66 leave her three shots from the lead in a tie for 10th place with fellow Aussies Karen Lunn and Nikki Campbell, American Hanna Jun, Becky Brewerton of Wales and Italian Diana Luna. The cut reduced the field to 70 players including amateurs Cecelia Cho of New Zealand and Minjee Lee, 14, the current Western Australian Amateur champion. They are four shots from the lead in a tie for 16th place. The leader board is crowded but Karrie Webb is unconcerned after a solid start to her seventh defence of the ANZ RACV Ladies Masters title at the Royal Pines resort on Queensland's Gold Coast. Webb shot a six under par total of 66 with two bogeys to be tied in the lead with compatriot Karen Lunn, Spain's Maria Hernandez, Eun-Hee Ji of Korea, France's Cassandra Kirkland and Diana Luna of Italy. Despite the talent in the leading group of six and the fact that Yani Tseng, the world No. 2 who won the Australian Open in Melbourne last week is only a shot back, Webb's focus is elsewhere. This week she has a chance to create a record in women's golf that may never been broken . Her run of seven wins here is already the best in women's golf, one ahead of Swede Annika Sorenstam who took out her national title - known variously as the Compaq Open, HP Open and Scandinavian TPC - six times between 1997 and 2006. Webb, 36, accumulated her seven wins between 1998 and last year when she produced a closing round of 61 to win by six shots. What is ominous for the field this week is her fast start in the benign morning conditions because many of her victories at Royal Pines and elsewhere in Australia have been from behind. "It is nice not to have to make up ground after the first round," Webb said. "There are still three rounds to go but it's a good start." With Sorenstam in retirement, the only current player within a bull's roar of the record is Se Ri Pak who won the Corning Classic on the LPGA tour five times between 1998 and 2007. If Webb does secure her eighth win this week, she will have the men's record in her sights. Five-times British Open champion Peter Thomson, who says she is Australia's greatest golfer, won the New Zealand Open nine times between 1950 and 1971. All the leaders except Luna played in the morning on a day Webb that said was made memorable because it was the first time she had played nine holes at Royal Pines in still conditions. The wind got up on their second nine and continued throughout the afternoon. Luna nearly ran them down late in the day, getting to six under by the 15th without dropping a shot but missed the last three greens. She was able to get up and down each time and should have the easier morning conditions tomorrow and post a score for Webb and Co. a score to chase. After missing the cut at the Australian Open last week, American prodigy Alexis Thompson celebrated her 16th birthday with a round of 69 to be three shots from the lead. The highlights of her round were an eagle at the par five third hole and a birthday cake she shared with tournament officials after the round. Stefani Michl and Linda Wessberg also had eagles at the par three fifth and 11th holes respectively. Wessberg was left to rue the fact that there is a $60,000 Peugeot car on offer for an ace at the 11th on the weekend. A gallery of 3894 watched the first days play while interest in the tournament's website peaked at 1000 hits every 30 seconds. CAN WEBB MAKE IT TITLE NUMBER EIGHT? The question on everyone lips is 'can she do it again, for an incredible eighth time?. Yes, they are talking about Karrie Webb (OAM) arguably Australia's best ever golfer. The Queenslander has won the Ladies Masters an amazing seven times and will be gunning for number eight when the ANZ RACV Ladies Masters gets under way at the RAVC Royal Pines Resort this Thursday. When asked if it will be title number eight the World Golf Hall of Fame member responded, "I hope so, it's always a great feeling to come back here, it's an even better feeling when I am defending champion, I would love to be up there in the mix on Sunday, so will see what happens." Is there any reason why it shouldn't be, she replied, "No, I don't think so , I think hopefully the great memories I have around this golf course and the good feel I seem to have every time I tee up here, hopefully with the hard work I did this morning those things will iron out pretty quickly, just because I think I have a little bit more confidence." ISPS Handa Women's Australian Open champion Yani Tseng will be one of Webb's biggest threats this week. Tseng is full of confidence heading into the week and was buoyed to learn that with her Open win she has moved to No.2 in the Rolex Women's Golf Rankings. A win this week could see her achieve one of her ultimate goal, to be World No.1. When asked about that at today press conference she responded, "It would be a dream come true. When I was twelve my dreams were to be world number one and I know it was very very far away. But now I am sitting here and I have a chance to get to be work number one, it feels it means a lot." Putting is the key to winning this week said the LPGA's 2010 Rolex Player of the Year, "This week is more of a putting competition. The putting is very important." An array of talent from all corners of the globe will be on show, players from Australia, America, Europe, Taiwan, Japan and Korea will tee it up and will be looking to dethrone the queen of Royal Pines, Webb. LET players to watch this week include England's Melissa Reid who finished runner-up to Tseng last week at the Open, European No.1 in 2010 South African Lee-Anne Pace and three-time winner of this event England's Laura Davies. A strong American contingent is also here including Angela Stanford, Stacy Lewis, Amanda Blumenherst and teenage sensation 15-year old Alexis Thompson. Thompson, who turns 16 on Thursday is making her first appearance at the ANZ RACV Ladies Masters. The 15 year old turned pro at the tender age of 14 is not a member of any tour but instead plays at various tournaments around the world on sponsor invites. She is a phenomenal talent, in her 7 starts on the LPGA tour in 2010 her best finish was runner-up at the Evian Masters in France, whilst she also finished tied 10th at the US Women's Open in July. The American won over US$330,000 in prizemoney. Hull will lead the Australian contingent, confident she can regain the title she almost defended in 2010. The Sunshine Coaster is coming off her most successful year on the LPGA where she captured her second LPGA title, the Navistar LPGA Classic and finished runner up at the RICOH Women's British Open. Nikki Campbell, Kristie Smith, Frances Bondad and Tamie Durdin are all likely challengers. All be vying to keep the title in Australian hands. A total of 144 players will tee it up at the magnificent RACV Royal Pines Resort, with players will be vying for their share of the $500,000 prizemoney. 2.00pm - Press conference in media centre with Alexis Thompson, the 15-year-old professional who won more than $330,000 on the US LPGA Tour last year. 2.30pm - Press conference in media centre with Karrie Webb, seven time winner of the Ladies Masters. 3.00pm - Press conference in media centre with Yani Tseng, winner of last week's Handa Australian Open at Commonwealth Golf Club in Melbourne. Wendell Sailor playing in Pro-Am with Carly Booth of Scotland. They tee off from the 9th hole at 6.45am and will finish at the 8th hole at approximately 12.15pm. Ian Healy playing in the Pro-Am with Laura Davies. They tee off from the 10th hole at 6.45am and will finish at the 9th hole at approximately 12.15am. First round of ANZ RACV Ladies Masters from approximately 6.45am. 2.00pm: Inaugural ANZ RACV Junior Masters played over nine holes on the Blue 9 Course by girls aged 12 to 18. Presentations at the Blue Zone, near the practice green, at 4.15pm. 11.00am - 1.00pm: Appearances by Batman and Wonder Woman, located on the podium lawn area. The 2011 ANZ RACV Ladies Masters will continue its tradition of showcasing the finest golfing talent and discovering a new generation of world beaters. To be played at the RACV Royal Pines Resort on Queensland's Gold Coast from 10-13 February, the tournament has an enviable reputation for launching little known players on stellar careers. It began in 1993 when tournament founder Bob Tuohy, an astute judge of talent, found a spot in the field for a young Swedish rookie named Annika Sorenstam. World No. 1 Laura Davies won that year and Sorenstam finished four shots back in eighth place. In 1994 Tuohy also staged the Women's Australian Open in Adelaide and gave Sorenstam a start there as well. She broke through for her first professional win and followed it with another 89 victories around the world including 10 major championships and three Ladies Masters. The same year a shy young amateur from Ayr in outback Queensland was invited down to Royal Pines to see how the world's best pros played. Her name was Karrie Webb and she finished second to Davies, still ranked No. 1 in the world. From there her career blossomed and she now has 50 wins to her credit including seven at Royal Pines. Described by Peter Thomson as Australia's greatest golfer, Webb will be attempting to win the title for the eighth time and break her own Ladies European Tour record of seven wins in the one event. Next best is Sorenstam with six wins in the Swedish Open. Se Ri Pak was invited into the field in 1997, aged 20 and unknown outside Korea, and finished sixth behind Canadian Gail Graham. The following year she won the first two of her five majors and in 2007 was inducted into the World Golf Hall of Fame where she was later joined by Webb, Davies and Sorenstam. In 2003 little known Mexican Lorena Ochoa was an invitee and finished fourth behind Davies. When she retired in 2010 she had been the world No. 1 for three years and won 27 US LPGA events including two majors. While the talent discovered to this point had been impressive, 2006 was a stand-out year. The title was won by amateur Amy Yang, a 16-year-old Korean high school student living on the Gold Coast. Cheered on by her classmates, she beat seasoned American campaigner Catherine Cartwright in a play-off. She remains the LET's youngest winner and has since won twice as a pro in Europe. Yang's performance overshadowed Taiwanese amateur Yani Tseng who finished third, a shot out of the play-off. The next year she turned pro and three of her five wins to date on the US Tour are majors. Korea's Ji-Yai Shin was the find of 2007, running second to Webb. In 2008 she won the British Open and is currently ranked No. 1 in the world. This year, as usual, there are plenty of hugely talented young players looking for their first professional win at Royal Pines. American Alexis Thompson could be the one. She turned pro at 15 last year and won more than $330,000 from five starts. For those who look for omens, she plays the first round on her 16th birthday. Greg Norman thinks Spanish beauty Belen Mozo, 22, has what it takes because he sponsors her. The 2006 British Amateur champion finished third at the US Tour School and is making her pro debut in Australia. Sweden's Caroline Hedwall, 21, is also playing as a pro for the first time after winning her LET card at La Manga in Spain where she finished nine shots ahead of the field. Carly Booth from Scotland caught the attention of Nick Faldo when she made the 2008 British Curtis Cup aged 16 and won her European Tour card at 17. As a member of Team Faldo she receives coaching and support from the six-times major winner. Can Webb, who is playing her 18th straight Ladies Masters, keep these youngsters at bay? On the evidence of 2010, when she shot a closing 61 to win by six shots from Katherine Hull and Korean Bo-Mee Lee, she is in with a big chance. TA Golf, Organiser’s of the Ladies Masters announced today the Royal Automobile Club of Victoria (RACV) would join long standing Title Sponsor ANZ as the Co-Title Sponsor of the Ladies Masters from 2011. The ANZ RACV Ladies Masters will be played at the RACV Royal Pines Resort on Queensland’s Gold Coast between 10-13 February 2011 under the co-sanctioning of Australian Ladies Professional Golf and the Ladies European Tour. Sue Blake, RACV Executive General Manager Member Interests said “RACV is proud to be extending our support of this fantastic event, which showcases the best in women’s golf and is part of our strong commitment to providing quality recreational and leisure experiences for our members”. 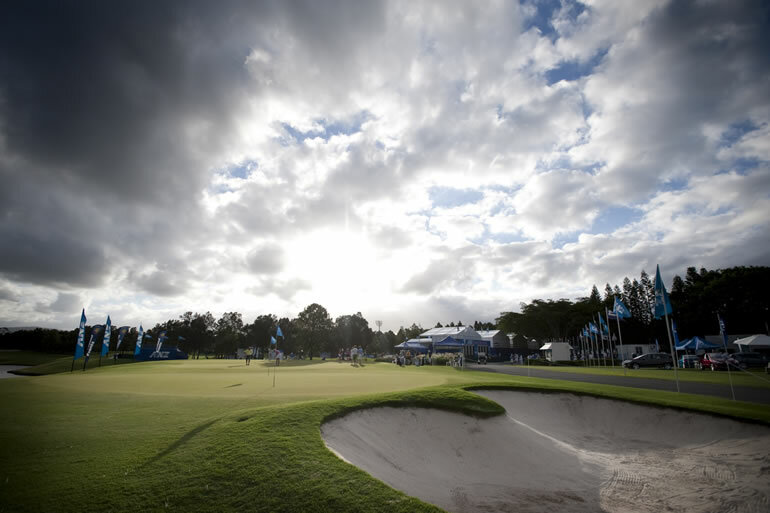 Positioned between the Handa Women’s Australian Open, 3-6 February and the Pegasus NZ Women’s Open in Christchurch, 17-20 February, the ANZ RACV Ladies Masters is certain to attract a world class field and provide priceless domestic and international television exposure for its key stakeholders. The much anticipated battle between the undisputed champion of Australian Women's golf, Karrie Webb, and arguably her heir apparent and the defending champion of the ANZ Masters, Katherine Hull, appeared as if it might become a reality on day four of the event at Royal Pines on the Gold Coast. Webb would eventually run out the winner by a massive six shots over Hull and Korean Bo Mee Lee but she was pressed hard in the first 14 holes today before extinguishing the challenge of Hull and others and then waltzing to an emphatic victory, her 7th in the past 13 stagings of the event. Webb led by one heading into the final day over Hull and Lee, but by the turn she had moved two ahead of Hull and three ahead of Lee. On paper that sounds straight forward enough but Webb produced some heroics over the opening nine holes that are well worth recounting. All three in the final pairing would birdie the first but Webb holed lengthy birdie putts at 3rd and 4th and at that point was two ahead of Lee and fellow Korean So Yeon Ryu, with Hull unable to keep pace at that point. Hull moved closer when she pitched in from short of the green for birdie at the par three 5th and gained further ground when she holed from 15 feet at the 6th. She had moved within one of Webb but the six time champion was about to produce something quite special. Webb’s tee shot at the par four 7th finished along the left of the fairway providing a perfect angle to a hole cut in the front right of the green. From 120 metres and from a slightly downhill lie in the fairway her 9 iron flew straight and true catching the flagstick and dropping into the hole for an eagle. All of a sudden Webb was three ahead of Hull but the Sunshine Coast’s favourite golfing daughter had a trick or two left of her own. She hit a superb approach to 5 feet at the 8th for birdie and then birdied the 9th but Webb would also birdie the par five 9th and as they made the turn Webb was two ahead and three ahead of Bo Mee Lee. Webb and Hull had opened up a break from the rest of the field and although others were within striking distance, it appeared at that point as if the closing nine holes would develop into a duel between Webb and Hull. So it was to prove. The pair traded blows in the early stages of the back nine but when Webb holed from 25 feet at the 14th she moved three clear. Surely with her experience and the momentum she was building then surely this was an unassailable lead? It certainly was as Webb hit two great shots to just off the back edge at the par five 15th and had not only moved four ahead of Hull but has moved to 10-under for the day. Was the previous tournament record of 26 under in jeopardy and was a 59 possible? Three birdies over the closing three holes would see her become the first Australian to break 60 in either an ALPG or PGA Tour of Australasia event and the manner in which she was playing it was certainly not beyond the realms of possibility. A par at the 16th put those thoughts to bed but a tournament record was still on the cards. When Hull bogeyed the 17th, Webb was about to enjoy the thrill of a five shot lead playing the last and that would allow her the opportunity to not only enjoy such, but the plaudits of the crowd as she graced the 18th fairway as a winner for the 7th time. Hull’s dropped shot allowed Lee to join her in a share of second position as the final trio headed to the last hole and there would therefore be much interest in who finished as runner-up. That honour would be shared between Hull and Lee but there was no mistaking who would take the major honours. Karrie Webb was not only able to match her tournament record but she produced a new course best of 61 (not a record due to preferred lies being in force) and reasserted her position as the Queen of Royal Pines. Hull probably best summed up the feelings of the also rans. “It was nice that I was able to challenge her for a while but Karrie was impressive to watch. She played flawless golf – you can never rule out a Hall of Famer.” The round of 61 also matched her previous low in tournament golf recorded in 2000 at the LPGA’s Oldsmobile Classic. Hee-Kyung Seo finished alone in 4th position at 19 under but there would be another four shots back to the 5th placed So Yeon Ryu while in a share of 6th place was Tamie Durdin whose last round of 65 was the second best of the day. Denmark’s Iben Tinning shared 6th with Durdin. First round leader, Amanda Blumenherst, birdied her final hole of the day to join the early second round leader Ji-Na Lim in the lead at the completion of 36 holes at the ANZ Ladies Masters at Royal Pines on the Gold Coast. That pair enjoys a two shot break over Australians Karrie Webb, Katherine Hull and Tamie Durdin and Koreans Seo Yeon Ryu and Hee-Kyung Seo. In darkening and, at times, wet afternoon conditions, Blumenherst made a slow start today but was soon into stride, making the turn in one under 34 and adding further birdies at the 3rd and 4th (her 12th and 13th holes) to move to 9 under and into a share of the lead with Lim. Lim had completed her second round of 66 five hours earlier and with the reachable par five 9th hole still to come it appeared that Blumenherst might just retain her outright opening round lead. Blumenherst’s group of Sarah Oh, Tania Elosegui and the American were placed on the clock after losing contact with the field early in their back nine. Blumenherst appeared a little rushed when she arrived at the second to last hole of the round, the par four 8th. A bad tee shot there led to a bogey but she hit a superb drive at the last to set up a closing birdie and she had a share of the lead again. Lim, who played in the morning group on day, is playing the ANZ Ladies Masters for the fourth consecutive year, her previous best finish coming in 2009 when 36th. A significant improvement in Lim’s short game has led to an elevation in her status on the Korean LPGA Tour, winning for the second occasion there in 2009 and finishing 8th on their money list. Lim was out in two under 35 but then stormed home in the humid overcast conditions with a back nine of 31 to finish with 66 and when she faced the media at 12.30pm she led by two. Highlighting the strength of the Korean LPGA Tour is that the number one and two on that tour’s 2009 money list were amongst those sharing third place behind Blumenherst and Lim. Ryu and Seo were prolific winners on the Korean LPGA Tour in 2009, Seo winning on five occasions and Ryo four. Ryu also won the Ladies China Open and, very importantly in the context of this event, was runner up to Katherine Hull here last year. South Australia’s Tamie Durdin was one of the talking points of day one, both good and bad. When she made the turn in her opening round she was at seven under and even at that early stage held a four shot lead. She would tumble badly over her closing nine holes to finish with a three under 69. How would she handle that let down on day two? Well any questions in that regard were quickly answered when she played those same horror nine holes in 34 today and she had quickly moved within three of Lim. When Durdin finished with a round of 68 to be in the group at 7 under she had completed an impressive and gutsy comeback. Six time champion, Karrie Webb, and defending champion Katherine Hull were also out late in the day and both stayed very much in touch. “I’m happy with the position with I am in being just two shots back,” said Webb after her two birdies in her last three holes kept her in touch. The cut fell at even par with exactly 65 players making it through to the weekend. Queensland can boast a piece of golfing history following today’s confirmation that the 2010 ANZ Ladies Masters has secured the strongest field ever assembled for a golf tournament in this country. The prestigious event, to be contested at the RACV Royal Pines Resort on the Queensland’s Gold Coast between the 4 and 7 March has confirmed the appearance of three of the four major champions from 2009. This marks the first time in Australian golfing history that three current major champions will contest the same event on Australian soil. Kraft Nabisco Champion, American Brittany Lincicome, Women’s US Open Champion, South Korean Eun Hee Ji and McDonalds LPGA Championship winner and World No. 7, Swede Anna Nordqvist, will headline the star studded field. Supporting and challenging the current major champions will be a plethora of top 20 players from the Rolex Women’s World Golf rankings. These include World No.3 Suzann Pettersen, World No. 6 Yani Tseng, South Korean Na Yeon Choi (No.12), our own World Golf Hall of Famer and six times Masters Champion Karrie Webb (No.13), South Korean Song-Hee Kim (No. 14), European No.1 and World No. 18 Sophie Gustafson. The international players do not stop there, South Koreans Hee Young Park (36), Hee Kyung Seo (No. 42) and M.J Hur (No. 45), Americans Stacey Lewis (No. 47) and the flamboyant Christina Kim (No.48) are all heading to the magnificent RACV Royal Pines Resort, most for the first time. A field comprising 8 of the top 20 and 15 of the top 50 world ranked players, is also unprecedented statistic for an Australian professional golf tour event. Three Australians have previously won the ANZ Ladies Masters. Webb is a six times champion, Jane Crafter won twice in the 90’s and Katherine Hull is the defending champion. Hull, Webb and fellow compatriots including World No. 28 Lindsey Wright, Nikki Campbell and Tamie Durdin, both of whom won on the LPGA of Japan in 2009, three time LPGA tournament winner Wendy Doolan, LET multiple title winners Nikki Garrett, Joanne Mills and Karen Lunn will be fighting to keep the title in Australian hands. The established players will however need to look over their shoulders, as the tournament has a reputation of uncovering a rookie star who upstages the stars. Young Australian rising stars including Kristie Smith, Rebecca Flood, Leanne Bowditch, Kate Combes and Sarah Oh will be keen to repeat the efforts of 2006 champion, 16 year old Amy Yang, as they relish in the strongest field on the biggest stage of their fledgling careers. No one will discount former World No.1, winner of over 70 titles worldwide including three Ladies Masters titles, reigning Women’s Australian Open Champion and crowd favourite England’s Laura Davies, who will be as keen as ever to add another title to her unparalleled list of international victories. ANZ Managing Director Strategy and Marketing David Lindberg said ANZ was looking forward to its tenth ANZ Ladies Masters and welcomed elite golfers from here and around the world. “With some of the world’s top ranking female golfers competing, the 2010 ANZ Ladies Masters looks set to be one of the most thrilling tournaments yet. It’s not difficult to see why it is now firmly established as one of the key features of the international golf calendar,” Mr Lindberg said. ANZ is proud to continue its support of the ANZ Ladies Masters which reflects not only our commitment to women’s golf, but also our commitment to Queensland and the Gold Coast, as a thriving global destination. The tournament will be shown on ONE HD on the Friday, then on Channel 10 on Saturday and Sunday and broadcast internationally to a reach of over 160 million households. Tickets now on sale at all Ticketmaster outlets. ANZ Ladies Masters proudly supporting the National Breast Cancer Foundation. 2009 European No.1 Sophie Gustafson has confirmed she will return to the ANZ Ladies Masters for the first time in six years when she tees it up at the RACV Royal Pines Resort between 4 and 7 March 2010. The 36-year-old Swede, who enjoyed a very successful year on both the Ladies European Tour (LET) and US LPGA, will certainly be a crowd pleaser at the tournament due to her big hitting and aggressive style of play. In just four appearances on the LET in 2009, Gustafson collected Euro 281,310.00 to edge out Scotland’s Catriona Matthew as the highest money earner on tour. By finishing on top of the Henderson Money List she was officially crowned the European No.1. It is the fourth time the Swede has finished on top in Europe. Gustafson, who has won 13 times on the LET, finished runner-up twice in her four starts in 2009. She finished tied second in June at the AIB Ladies Irish Open and then lost in playoff Japan’s Ai Miyazato in the co-sanctioned Evian Masters in France. On the LPGA, she secured her fifth LPGA title in September when she carded a final round 68 to hold off World No. 1 Lorena Ochoa to win the CVS/pharmacy LPGA Challenge. Along with her win, she also posted another six top 10 finishes. Gustafson finished the LPGA season 17th on the Money List with US$792,359.00 taking her LPGA career prizemoney to over $US5.3 million. She is currently ranked 18th on the Rolex Women’s World Golf Rankings. The Swede will join the best field ever assembled at the Masters, including compatriot and World No. 7 Anna Nordqvist. The international players will not have it their own way, with defending champion Queensland’s Katherine Hull leading the Australian contingent. She will be supported by former World No. 1 and six times ANZ Ladies Masters champion Karrie Webb (World No. 13), Wendy Doolan, Karen Lunn (leading Australian on the 2009 LET) Nikki Campbell and 2009 ANZ Ladies Masters runner-up, Tamie Durdin. The 21st ANZ Ladies Masters will be played at the RACV Royal Pines Resort on Queensland's Gold Coast from 4 to 7 March and will be broadcast by Network Ten and One HD on March 5 to 7. Tickets now on sale at all Ticketmaster outlets. ANZ Ladies Masters proudly supporting the National Breast Cancer Foundation. Further announcements regarding international player commitments will be made over the coming weeks. 2009 LPGA Major, Tour Championship and Ladies European Tour Rookie of the Year winner Anna Nordqvist will make her first appearance in Australia as a professional when she competes at the ANZ Ladies Masters to be played at the RACV Royal Pines Resort, Gold Coast, Queensland in March. The 22 year old Swede has enjoyed an amazing rookie year since turning professional last December. Nordqvist made headlines around the world in June when she won in just her fifth start as a professional. Not only did she secure her first victory on the LPGA Tour, but it just happened to be a major, the McDonalds LPGA Championship presented by Coca-Cola. She topped off her year with a win in the season ending LPGA Championship presented by Rolex, where she carded a final round seven-under par 65 to defeat world number 1, Lorena Ochoa, and a field which included the top 60 LPGA Tour players. Nordqvist, who secured her 2009 LPGA Tour card through last year’s Qualifying tournament, recorded five top 10 finishes in 17 starts, finished the year 15th on the LPGA Money List with $US871,785 and is now ranked 7th on the Rolex Women’s World Golf rankings. Nordqvist joined Mexico’s Lorena Ochoa, South Koreans Jiyai Shin and Na Yeon Choi as the only multiple winners on the LPGA Tour this year. The Swede is also a member of the Ladies European Tour (LET) after she finished on top of the leader board at the Q-School at the start of 2009. In six appearances on the LET, she finished 13th on the Henderson Money List and secured the Ryder Cup Wales Rookie of the Year. She also made her debut appearance in the Solheim Cup played in September. The Swede will join the best field ever assembled at the Masters. Fellow Australians that are confirmed starters include former World No. 1 and six times ANZ Ladies Masters champion Karrie Webb (World No. 13), Nikki Campbell, who won in Japan this year and Sarah Kemp. ANZ Ladies Masters Tournament Chairman Bob Tuohy, welcomed the news of Nordqvist inclusion in the field. “Anna has rocketed into prominence in her rookie year, and has become a truly world class player in a very short space of time. The 2010 ANZ Ladies Masters will benefit greatly from her inclusion as we welcome yet another major winner to the tournament which has a history of attracting the big names." Warren Sevil, CEO of the Australian Ladies Professional Golf Inc announced today that in co-operation with Co-Sanction Partners, The Ladies European Tour, Tuohy Associates, promoters of the ANZ Ladies Masters, Golf Australia, organisers of the Women’s Australian Open and other key stake holders, the dates for the 2010 ANZ Ladies Masters and the Women's Australian Open Championship have been rescheduled from the previously published dates. The move is a result of a late scheduling change on the US LPGA Tour, and is necessary to avoid a clash with the opening of their season in South East Asia early next year. Mr Sevil said "In the best interests of our players and the ongoing success of our two major events in Australia, our decision will certainly provide the opportunity for our Tour and our Promoters to meet sponsor criteria through the securing of a world class field of local and international players next summer. The change will also guarantee delivery of the required exposure to domestic and international television audiences. "Despite the enormous task of rescheduling, we have been very fortunate to have received such wonderful support and cooperation from our sponsors, host venues and the Ten Network. The new dates are likely to work in our favour in terms of strength of field and we look forward to welcoming many of the world's best players to our major events early next year"
Sunshine Coast girl Katherine Hull will return home to defend her ANZ Ladies Masters title at the RACV Royal Pines Resort early next year. Hull, 27, was in superb form when she beat a star-studded field that included six-time winner Karrie Webb, reigning US LPGA champion Yani Tseng and reigning British Open champion Jiyai Shin in March. She clinched the title with a closing 68 that included three birdies in a row from the 12th hole to finish at 16 under par and five shots clear of fellow Aussie Tamie Durdin and Korea's So Yeon Ryu. The fairytale result followed her maiden US Tour win at the Canadian Open in August '08 and a month after her big win at home she was runner-up to Shin of Korea in the HBSC Women's Champions title in Singapore. The 2010 ANZ Ladies Masters gives Hull, ranked No. 14 in Rolex World Rankings, the opportunity to join an elite band of multiple winners – Karrie Webb (6), Annika Sorenstam (3), Laura Davies (3) and Jane Geddes (2) who are all ‘major champions, and Jane Crafter (2) who is now retired but maintains her ties with the tournament as a TV commentator. The 21st ANZ Ladies Masters will be played at the RACV Royal Pines Resort on Queensland's Gold Coast from 4 - 7th of March. A further announcement about international players in the field will be made in late August. For the first time since the introduction of the Rolex Women’s Golf Rankings three Australians figure in the Top-15 players in the world. Following last week’s runner-up finish at the year’s second major, the McDonald’s LPGA Championship, Lindsey Wright has jumped 17 places to be ranked No.12. 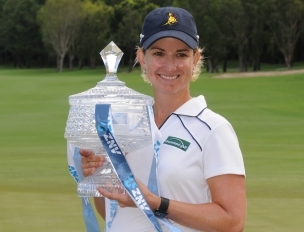 6 Time ANZ Ladies Masters Champion Karrie Webb remains the highest ranked Australian at No.10 with fellow Queenslander and current ANZ Ladies Masters Champion Katherine Hull the third Australian at No. 13. Wright began the year ranked No.52 and has climbed up the rankings with some consistent performances in the first half of 2009. She has recorded six Top-20 finishes in her eleven starts this year, including three Top-10’s. This includes an outright 4th at the first major in April, the Kraft Nabisco Championship, tied 3rd at the Michelob ULTRA Open in May and her runner-up finish on the weekend. Australia now has the second highest representation of players inside the Top-15 on the Rolex Rankings with three (equal to the USA). Korea leads the way with five. Australian Katherine Hull cruised to a five stroke victory at the ANZ Ladies Masters at RACV Royal Pines Resort in Australia on Sunday and confirmed her status as one of her country’s fastest rising sporting stars. Hull, who began the final round with a three stroke lead over compatriot Tamie Durdin, recorded a winning total of 16-under-par 272. The 26-year old LPGA Tour regular fired rounds of 69, 67, 68 and 68 and became only the third Australian to win the tournament in its 20-year history, after Jane Crafter and Karrie Webb. “If anyone would have said to me that I would shoot four rounds in the 60s I would have been absolutely ecstatic,” said Hull, who collected a winner’s cheque for $90,000. Last year’s European No.1 Gwladys Nocera (67) tied for fourth with Australian Sarah Kemp (68), American Mollie Fankhauser (70) and world No.2 Yani Tseng (66). Nocera also took the early lead on the Ladies European Tour’s 2009 New Star Money List. Hull claimed her breakthrough win at the Canadian Women’s Open in Ottawa in August, which was her first win in five years on the US LPGA Tour. She had been close to victory over the last two weeks as a runner-up at the LG Bing NSW Ladies Open a fortnight ago and was joint second at last week’s New Zealand Women’s Open. With over US$1 million on the US LPGA Tour last year, she finished 13th on the money list and is now challenging Karrie Webb for the Australian No.1 spot. “To follow in Karrie’s footsteps would be awesome because she’s done so much and at such a young age. She has raised the bar for us Aussies. To be held in the same sentence as her is an honour. I’d love to go out there and win next week and get into the same category,” Hull said. Her final round began in perfect fashion when she birdied the first hole establishing a four stroke lead but Durdin edged within two when she birdied the sixth hole. Hull turned in two-under 35 with a three stroke advantage and effectively sealed the win with three consecutive birdies from the 12th. She led by six shots before taking her sole bogey at the final hole. Six-time Masters winner Karrie Webb had an unhappy 73 to finish in joint 30th on three-under-par. 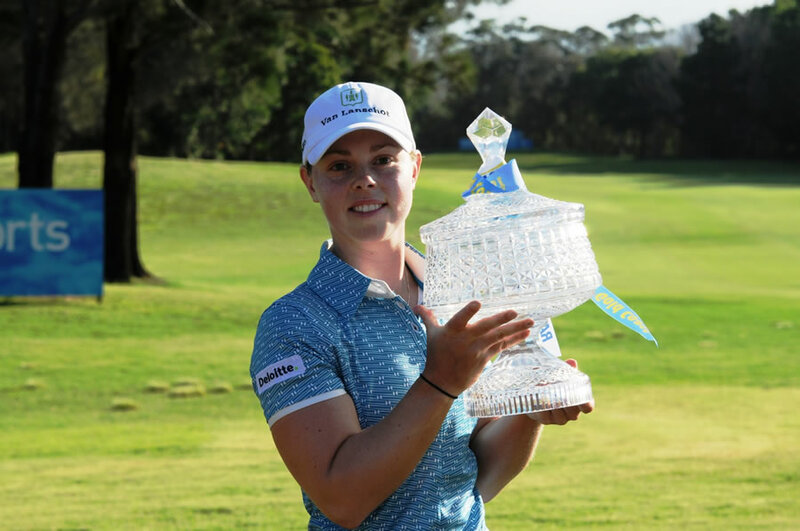 She blamed poor putting and a double bogey at the start of her round but was looking forward to defending her Women’s Australian Open crown this week at Metropolitan Golf Club in Melbourne. Cherie Byrnes, Katherine Hull, Nikki Campbell and amateur Rebecca Flood lead the Australian charge after the first round of the ANZ Ladies Masters. They all fired rounds of 3-under par 69 to be two off the pace heading into Friday. Welsh golfer Becky Brewerton grabbed a share of a four-way first round lead at the ANZ Ladies Masters on the RACV Royal Pines Resort. Along with South Africa's Lee-Ann Pace, Norway's Marianne Skarpnord and Korea's Il Hee Lee opened with five-under-par 67s, upstaging the likes of world No.2 Yani Tseng, who shot 71, world No.5, Ji-Yai Shin who had 69 and the six-time Masters champion Karrie Webb, who fired a 2-under par 70. Brewerton, a Solheim Cup player shared pole position after reeling off five birdies over the back nine of which she started on. She recovered from a double bogey six at the second hole with back-to-back birdies for an inward total of 37, even par. The 2007 Ladies English Open champion is making her fourth appearance at RACV Royal Pines Resort where she shot an opening round of 66 in 2007 before finishing tied for eighth behind Webb. “This is one of my favourite courses and I’ve done quite well here. I’ve got good memories and it suits my game well. If you can drive it long and straight you’ve got a real advantage,” Brewerton said. Brewerton recorded eight top ten finishes last season and was 15th on the New Star Money List for the third time running. She has been working hard over the winter in an attempt to bring her game up to the next level and has been put through her paces by her new fitness trainer Steve Bond. She cited a stronger mental approach as the key to overcoming the double bogey she took after snap hooking her ball into the root of a tree. “I think before if I had made a mistake like that I would have given myself too hard a time and ended up on one or two under when I should have been at least five under. In situations like that the work I have been doing has definitely helped,” she said. The 22-year-old Skarpnord equalled Brewerton’s 67 with three birdies on the front nine and two on the back. Her best finish was runner-up to world No.4 Suzann Pettersen at the AIB Ladies Irish Open in July last year. Pace, who will turn 28 later this month, was the only leader to have played in the breezier, but warm, afternoon conditions. Her best finish on tour was a tie for fourth at the SAS Ladies Masters in Norway last year. Lee, another talented player from the Korean Ladies Professional Golf Association (KLPGA), was runner-up to Shin in the Woori Ladies Tournament early last year. She started her round at the 10th and turned in 32 before picking up two more birdies coming home. She is known as one of the dragon ladies having been born in the year of the dragon. Like many of her generation her idol is Se Ri Pak. The incredibly strong field of the ANZ Ladies Masters has been further boosted by the inclusion of Japanese sensation Ai Miyazato. Runner-up to Karrie Webb in 2005, Miyazato, 23, joins a line-up that includes three current major winners - In-Bee Park (US Open), Yani Tseng (LPGA Championship) and Ji-Yai Shin (British Open). The ANZ Ladies Masters, the longest running and richest event on the ALPG calendar, is celebrating its 20th anniversary and will be played at RACV Royal Pines Resort on Queensland’s Gold Coast from 5 - 8 February. Miyazato, from Okinawa, made herself known to golf lovers around the world in 2005 when she finished 12 shots clear of the pack at the US Tour school and was LPGA Rookie of the Year in 2006. Not lacking in confidence, she signs her autograph ‘Ai-54’ which she explains is the score in the perfect round of golf made up entirely of birdies. On debut at Royal Pines in 2005 she equaled Webb’s course record of 63 on the first day and led the Australian by four going into the final round before losing by a shot. For Webb, it was the fifth of her six wins since making her debut as an amateur in 1993. Last year at Royal Pines Miyazato tied for 14th place with Australia’s Katherine Hull, seven shots behind winner Lisa Hall of England. A shot in front of her was Gwladys Nocera of France who has just been named the 2008 Players’ Player of the Year after five victories on the Ladies European Tour. A men’s field with the reigning major champions would include Tiger Woods, Trevor Immelman and Padraig Harrington. While the male champions make rare and fleeting visits to Australia, the top women have been supporting the tournament since its inception and given it credibility and respect around the world. Tseng, ranked No. 2 in the world, finished a shot behind teenage winner Amy Yang in 2006 and Shin, ranked No. 6, tied for sixth with Karin Sjodin in 2008. Webb, who was looking for her seventh win, was fifth. Webb and Shin also battled at out at the 2008 Women’s Australian Open where they both shot closing rounds of 67 before Webb won on the second hold of sudden death. Webb made up three strokes on Shin in the closing five holes, prompting five-times British Open champion Peter Thomson to write in the Age that “Karrie Webb’s astonishing win of the Women’s Australian Open at Kingston Heath on Sunday was the best performance of a golfer - man or woman - in the past 50 years”. Expect more of the same at Royal Pines in February. US Open Champion In-Bee Park will join the 20th Anniversary celebrations of the ANZ Ladies Masters at RACV Royal Pines Resort on Queensland’s Gold Coast next February. Park joins LPGA Champion and US LPGA Rookie of the Year, Yani Tseng (world #2) and RICOH British Open Champion Ji-Yai Shin (world #6), in undoubtedly the strongest lineup ever assembled in Australian golf. Tournament Promoter Bob Tuohy said “to secure three of the four Major Champions in our field at a time when we are celebrating such a significant milestone for the event, is a great thrill and most gratifying”. In her second season on the LPGA Tour in 2008, Park made her first victory a Major, when she defeated Helen Alfredsson to win the most coveted title in women’s golf in Minnesota last July. Not only have each one of these players won a Major Championship, but Tseng confirmed her enormous potential by securing the Rookie of the Year title on the LPGA Tour and Shin finished off her season by winning the coveted ADT Championship, where she landed the biggest winner’s cheque in women’s professional golf of US$1 million. Along with six time Champion Karrie Webb, defending champion Lisa Hall and the great improver in Australian golf this season Katherine Hull, these three Champions will ensure not only local interest but a massive audience nationally and internationally. One of the ANZ Ladies Masters’ favourite sisters of swing Laura Davies is again part of the field and so too will four time LPGA winner Canadian Lorie Kane, two time Major winner Brandie Burton and the standout player on the Ladies’ European Tour in 2008 Gwladys Nocera. In what is believed to be a first for Australian golf, three current Major Champions will line up head to head in the same event. The Sisters of Swing tee off at the RACV Royal Pines Resort between February 5 & 8, 2009. The ANZ Ladies Masters, co-sanctioned by the Ladies’ European Tour and the ALPG Tour, will be broadcast by Network Ten on February 7 & 8 and will reach an international audience in excess of 160 million households. Tickets now on sale at all Ticketmaster outlets. the 2010 ANZ Ladies Masters at RACV Royal Pines on the Gold Coast provided even greater cause for celebration of its 20th anniversary when the tournament’s promoters Tuohy Associates today announced that two of the most outstanding young talents in female golf are now confirmed for the event. 19 year old Taiwanese golfer, Yani Tseng, and 20 year old Korean, Ji Yai Shin, have both confirmed their entry to play and while both have played the ANZ Ladies Masters previously, their stunning seasons in 2008 now place them at another level in world golf. Given their rapid rise in world golf, they are sure to be huge attractions at the event to be staged from February 5 - 8 and will add further lustre to a field which will again include the six time ANZ Ladies Masters champion, Karrie Webb and Australian golf’s big mover in 2008, Katherine Hull. Tseng, who won this year’s McDonald’s LPGA Championship, has risen rapidly to the number two position in the Rolex Women’s World Golf Rankings behind only Lorena Ochoa, while Shin finished runner up to Karrie Webb at this year’s Women’s Australian Open and went on to win the 2008 Ricoh Women’s British Open and is currently ranked number eight (8) in the Rolex Women’s World Golf Rankings. In her rookie season on the LPGA Tour, Tseng won the McDonald’s LPGA Championship, making her first LPGA Tour victory a major championship. Tseng, who turns 20 in January, further enhanced her growing reputation by finishing runner up to Shin at the Ricoh Women’s British Open. With ten top 10 finishes in 2008, Tseng is assured of LPGA Tour ‘Rookie of the Year’ honors and with more than US$1.7 million in her first season in the US, it has been a brilliant debut in the big-time. On the Korean LPGA Tour, Shin won seven times in 2008, including all major championship, becoming the first player in KLPGA history to complete the season Grand Slam – winning all major championships in the same year. Shin recorded her second LPGA victory for 2008 at last week’s Mizuno Classic in Japan. Tseng has played the ANZ Ladies Masters on three previous occasions including finishing 3rd in 2006 and 5th in 2007, while Shin was runner up to Karrie Webb in 2007 and finished 6th in this year’s event. Tuohy also announced that he is currently in discussions with yet another major achiever in world golf in 2008 and expects to be able to announce further good news in that regard in the next few weeks. The ANZ Ladies Masters, co-sanctioned by the Ladies’ European Tour and the ALPG Tour, will be broadcast by Network Ten on Feb 7 & 8 and will reach an international audience in excess of 160 million households. Tickets are on sale Monday November 3 at all Ticketmaster outlets. ANZ Ladies Masters proudly supporting the National Breast Cancer Foundation. The ANZ Ladies Masters reaches a significant milestone in 2009 when the event celebrates 20 years as one of Australia’s leading golf tournaments. A close look at the history of the event highlights the tournament’s importance to not only Australian golf but to world golf generally and in 2009 it promises to again showcase many of the game’s established and emerging stars. RACV Royal Pines Resort on Queensland’s Gold Coast, as it has done since 1992, will play host to the event from February 5th - 8th. The outstanding tournament venue has itself proven to be a winner, in terms of its all round suitability to stage a tournament of this significance. The ANZ Ladies Masters has provided the launching pad for several of the female game’s greatest players of the modern era. Not only is that likely to be the case again in 2009, but several of the game’s great achievers over the past 12 months are also are in the sights of tournament organisers. Details of just who those players are will be announced in mid November but according to the event’s promoter, Bob Tuohy, a world class line-up can be expected. The tournament has played a significant role in launching the professional careers of Annika Sorenstam, Karrie Webb and more recently Lorena Ochoa, Ai Miyazato and Yani Tseng to name but a few. While we are confident that we will again witness the emergence of several exciting young players in 2009, it is the quality of the leading players we are assembling for the tournament that leads us to believe that the 2010 ANZ Ladies Masters will be one of the best in the event’s 20 years. The ANZ Ladies Masters, co-sanctioned by the Ladies’ European Tour and the ALPG Tour, will be broadcast by Network Ten on Feb 7th and 8th and will reach an international audience in excess of 160 million households. Tickets are on sale Monday November 3rd at all Ticketmaster outlets. England’s Lisa Hall fired a six-under-par 66 to take a one stroke victory at the ANZ Ladies Masters in Australia on Sunday. Hall came from one stroke behind the three overnight leaders Hyun Ju Shin, Tamie Durdin and the defending champion Karrie Webb to post a three round winning total of 13-under-par 203. Hall, playing in the penultimate three-ball, had posted her score as Shin stood on the 18th tee tied for the lead on 13 under. Hoping for a play-off, Hall watched from the back of the 18th green as Shin, from South Korea, putted. Shin had a 25 foot birdie chance for the title, but left it four feet short, and then missed the second putt, effectively handing Hall the title. “It was shocking,” said the 40-year-old Hall, who is originally from Stoke-on-Trent. “It wasn’t shocking in that she didn’t make it because in golf anything can happen but at that point it was the realisation that I had won. Shin was tied for the lead with Webb after five holes in the final round and was the outright leader until Hall rolled in a 12 foot birdie putt at the par-three 16th hole to tie for the lead. The 27-year-old Shin, a two time winner on the LPGA of Japan, dropped into second place after three putting the 18th, which was only her third bogey all week. She signed for a third successive 68 and finished on 12-under-par in total. England’s Felicity Johnson fired a tournament best of seven-under-par 65 in the final round to share third with Sweden’s Louise Stahle, who had a 67. Defending champion Webb was aiming to make history as the only player to have won a Ladies European Tour event seven times, but it was not to be. The MFS Women’s Australian Open champion took a one-stroke lead after an eagle at the par three third-hole but eventually signed for a 70 to finish in fifth place on ten-under-par. Hall, who resides in West Palm Beach, Florida with her husband, golf coach Martin Hall, admitted that she felt lucky all week. Hall won twice on the Ladies European Tour last year, in Northern Ireland and in Denmark, but she admitted that claiming her fourth LET victory was a huge achievement. “To shoot six under in the last round and beat Karrie Webb in Australia, it’s got to be high up there. I had two wins last year, both in play-offs and both very different. One was an eight-hole play-off and one was just one hole. I think with how I played the whole day and how the end result happened I don’t think it could get much better than that,” she said. By virtue of her victory, Hall has now qualified to play in this month’s HSBC Champions’ event in Singapore. But first, she may re-visit the casino. 14/02/2015 - WHAT A FIELD! 09/02/2011 - CAN WEBB MAKE IT TITLE NUMBER EIGHT? 10/02/2008 - ROYAL PINES RESORT, QUEENSLAND, AUST.